CUTwC runs a series of pub crawls throughout (mostly) the first two terms of the academic year, intending to visit every public house in Cambridge during that time. This is an excellent way to learn you way around Cambridge, so long as you don't mind asking "what pub's it near?" when being given directions. Last year's crawl can be found here. 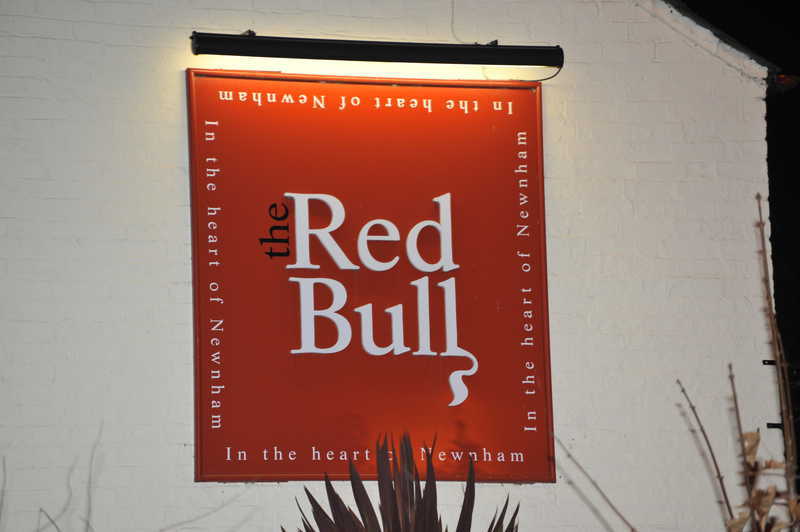 The Red Bull is on Barton Road, by St Mark's Church (if you've not yet learned to identify churches by what pub they're near). You can get there from Selwyn (or Robinson) by heading south along Grange Road, then turning left on Barton Road to head back towards Cambridge (and crossing the road). Visitor from other colleges may get here by crossing The Fen Causeway or heading south down Queen's Road and following Barton Road out of town. The Red Bull is convenient for tournaments at Selwyn, so be nice to them. From the Red Bull, turn right onto Barton Road and follow it when it veers north. Take the first exit at the roundabout (don't go down Fen Causeway). 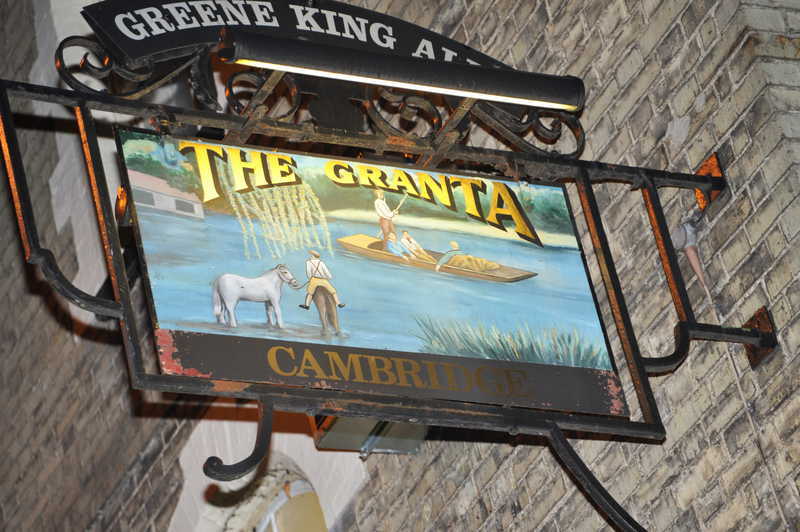 The Granta is on the right after the Mill Pond. If you got to Darwin, you went too far. Turn left from the Granta and then left away from the road to head east on the pedestrian path past the Mill Pond. Continue north alongside the Cam (mind out for cow pats) and cross the mill. 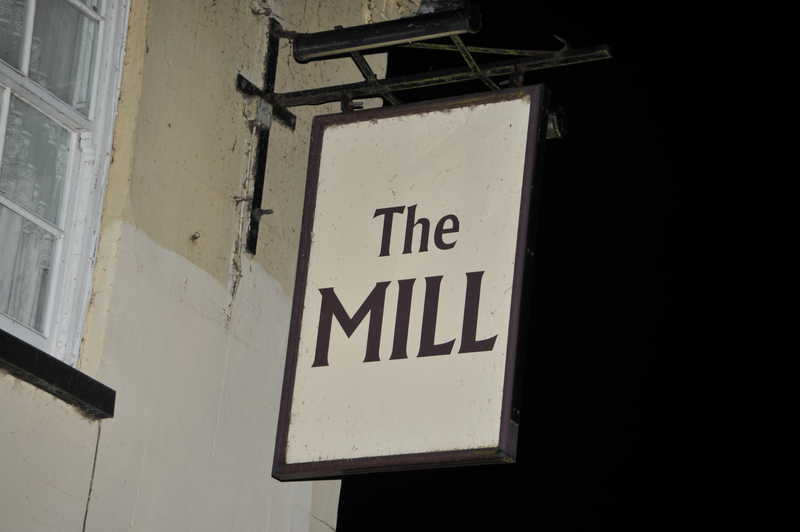 The Mill is, logically, by the Mill Pool on the corner of Mill Lane (and Granta Place). Mill Road is, confusingly, somewhere completely different. Leave the Mill, ideally by the exit not facing the river, and head straight across to go down the scary dark alley known as laundress lane. (If you go straight out of the wrong entrance, you'll get wet.) 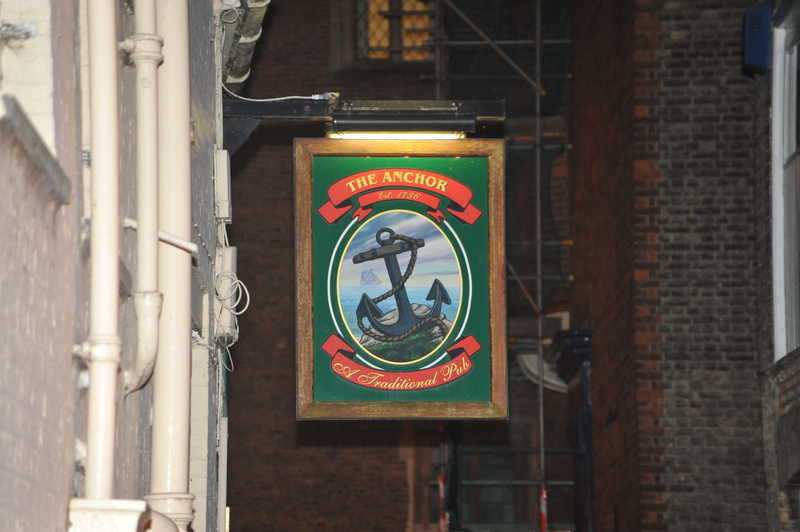 At the end, having walked past most of the Anchor, turn left onto Silver Street, then left again to enter the Anchor. Some part of it is still a pub. Leave the Anchor, turn right onto Silver Street, and head east (not back over the river). Tradition would suggest following around Queens' to the left, along Queens' Lane, then following through the tunnel between King's and Cat's, turning left onto Trumpington Street at the end. A route that smells less of urine is to go to the end of Silver Street, then turn left onto Trumpington Street. Cross Trumpington Street and head east onto Bene't Street, past the Corpus Clock. The Eagle is on the left. 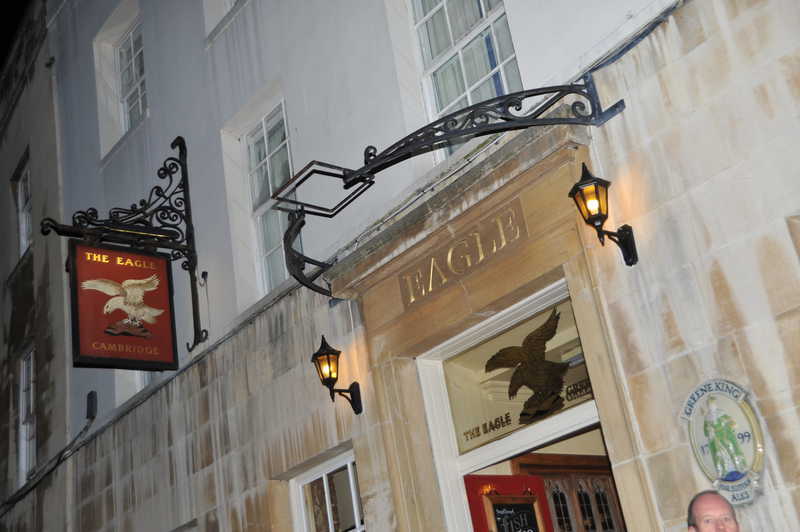 This one's tricky: leave the Eagle and turn left to continue along Bene't Street. 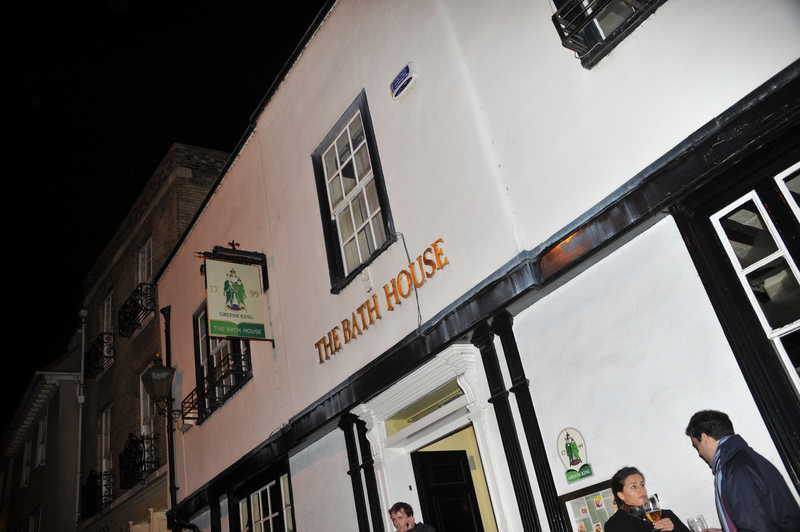 The Bath House is on the left. Don't get confused by the one on Gwydir Street, which is not so much a pub, and also a long way away (though ironically near Mill Road). Turn left out of the Bath House. The Pint Shop is on the right, kind of opposite Peas Hill. Longish walk now; leave the Pint Shop and head north up Peas Hill past the Arts Theatre and the market. Head north your choice of route onto Trinity Street; one way is to head between Mappin and Webb and Subway, past Gardenia's (good to know where this is) up Rose Crescent. Do not stop for a hadji, it will take the edge off your curry. Turn right onto Trinity Street, later St John's Street, heading north. Turn left onto Bridge Street past St John's. 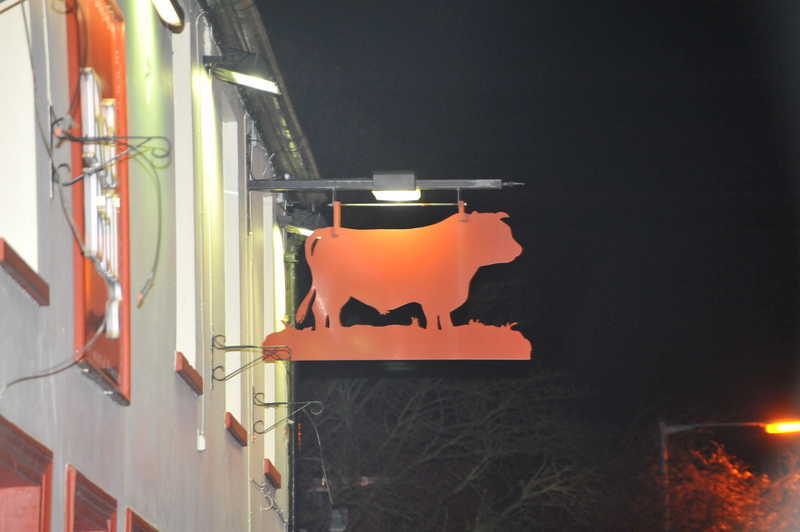 Cross over, and the Mitre is on the far side of the road as you head northwest, shortly before the Baron of Beef. It would be churlish not to leave the Mitre by heading away from Bridge Street and stopping at the Curry King. Return to civilisation by returning to Bridge Street and turning left. Heading down either Trinity Street or Bridge Street (eventually Sidney Street) takes you back to the town centre. 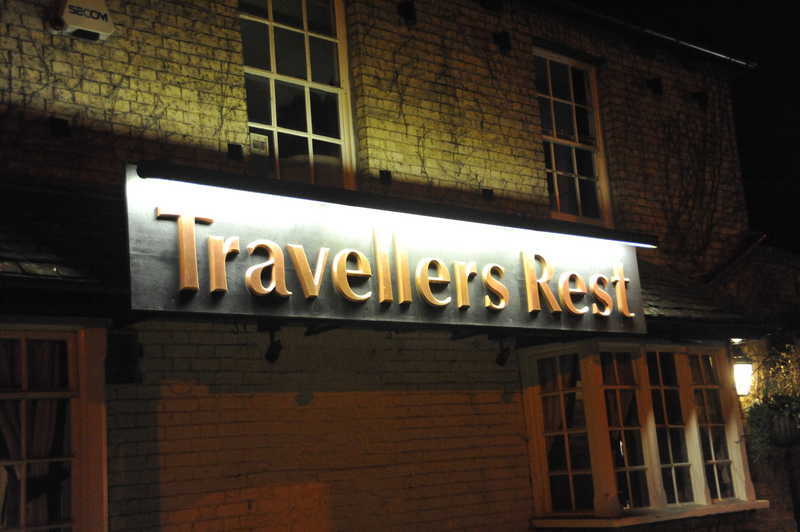 The Travellers Rest (which has historically been included, but whose staff currently describe it as "to be honest, a bar on the hotel, but a pub crawl would be cool") is on Huntingdon Road very close to the official city limits and not far from Girton College and opposite Whitehouse Lane. 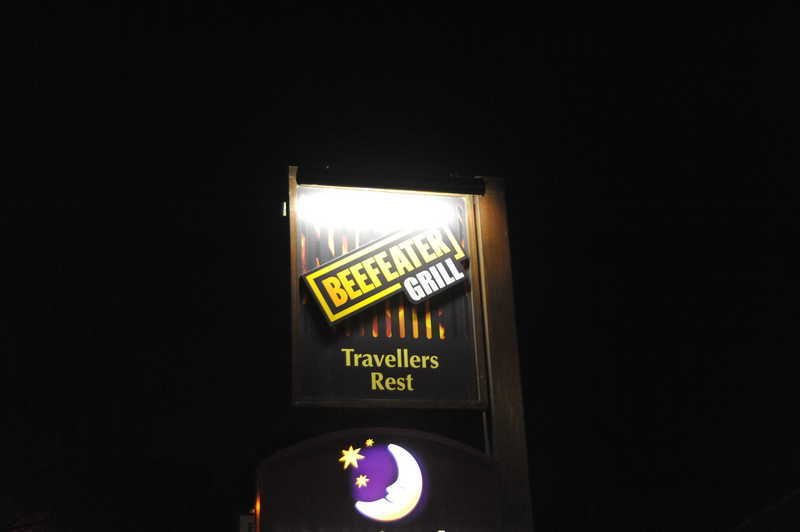 It is now part of a Premier Inn. It is not clear who the travellers are, and why they are resting, but it can't be us - we need to move on. Turn right out of the Travellers Rest and head southeast along Huntington Road. Continue (a long way) to the traffic lights with Victoria Road. Veer left and left again onto Histon Road. 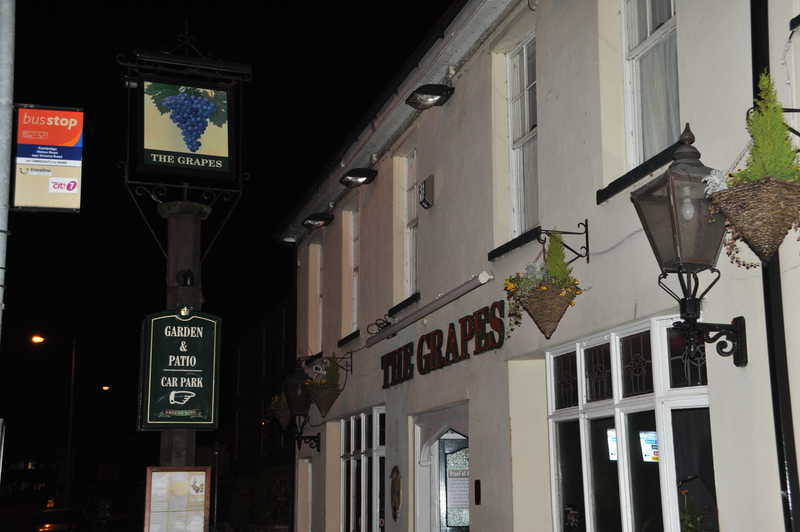 The Grapes is on the left (west) side of Histon Road, near the junction with Victoria Road. Turn right out of the Grapes, returning to the junction between Victoria Road an Histon Road. Cross Victoria Road and continue southeast onto Castle Street. 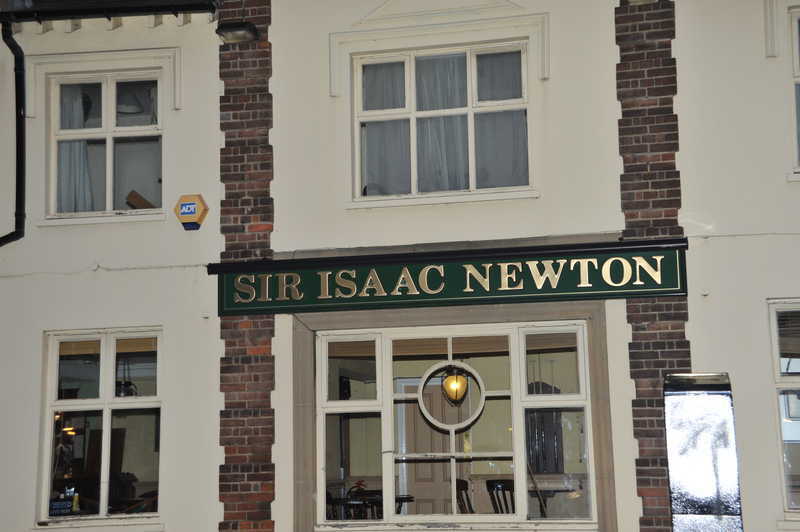 The Sir Isaac Newton is on the left (northeast) side. Turn left out of the Newton and continue southeast down Castle Street. Cross the road; the Architect is on the right (southwest side). Turn right out of the Architect and continue southeast, crossing the road again. 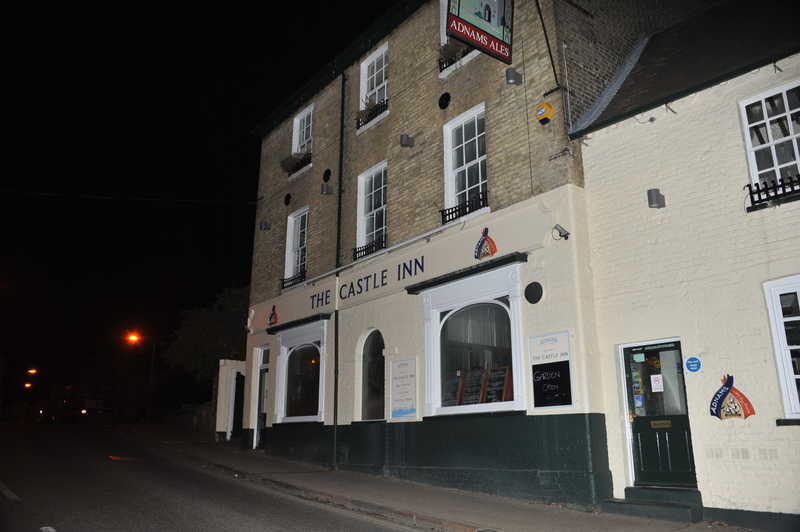 The Castle Inn is on the northeast side of the road just after the car park for the council offices. Cross Castle Street again and head down Whyman's Lane, beside the Architect. Turn left on St Peter's Street, then immediately right onto Pound Hill. Follow the road southeast. 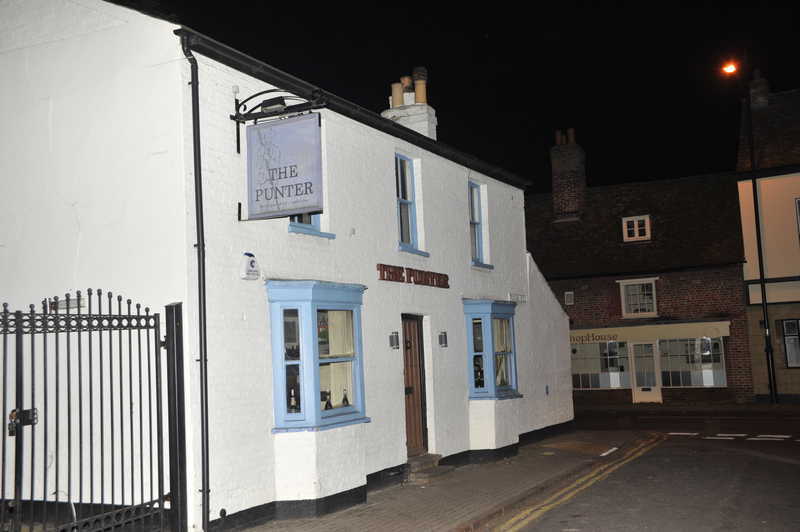 The Punter is on the left, on the corner with Northampton Street. Head northeast along Northampton Street to the crossroads, crossing the road to the southeast. Head southeast along Magdalene Street. 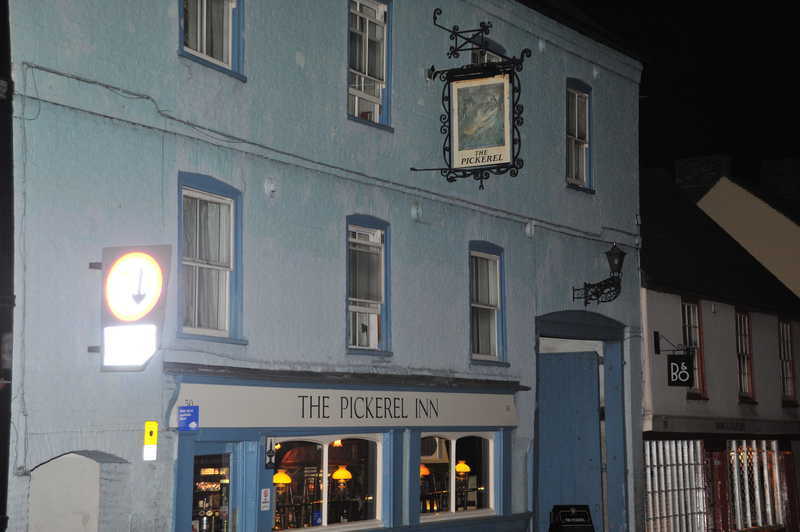 The Pickerel Inn is on the right, opposite Magdalene College. Turn right from the Pickerel and cross the road. Continue southeast across Magdelene Bridge. 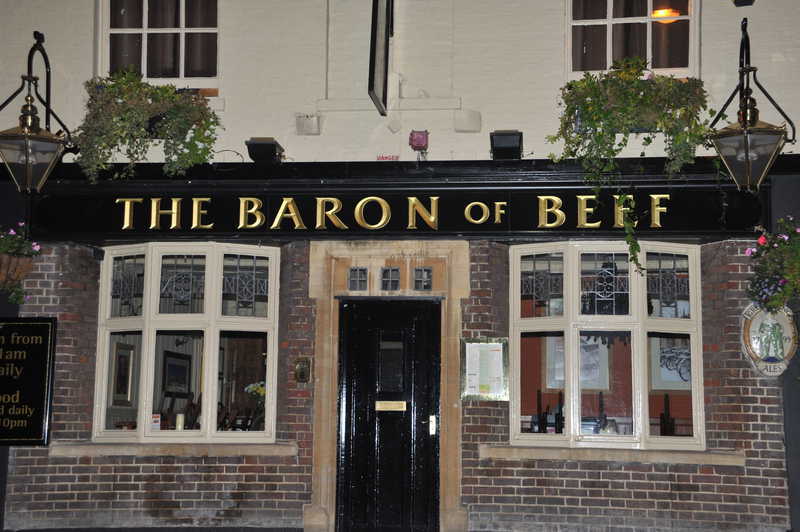 The Baron of Beef is just before Blackamoor Head Yard, on the left. 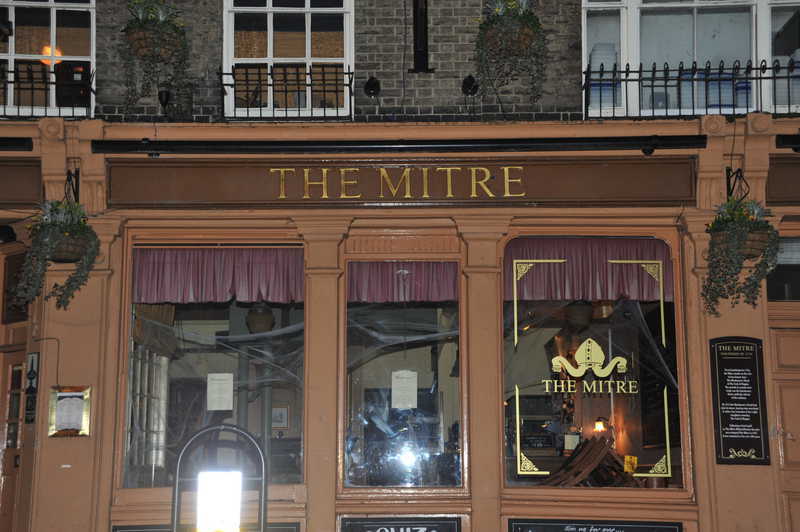 The Curry King is behind the Mitre. Head back to town by turning southeast down Bridge Street. 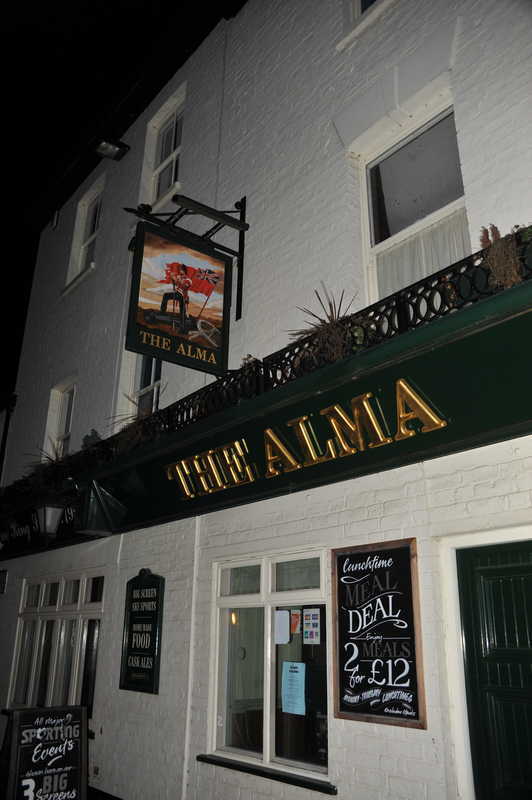 Meeting at the Burleigh Arms at 7:30pm. 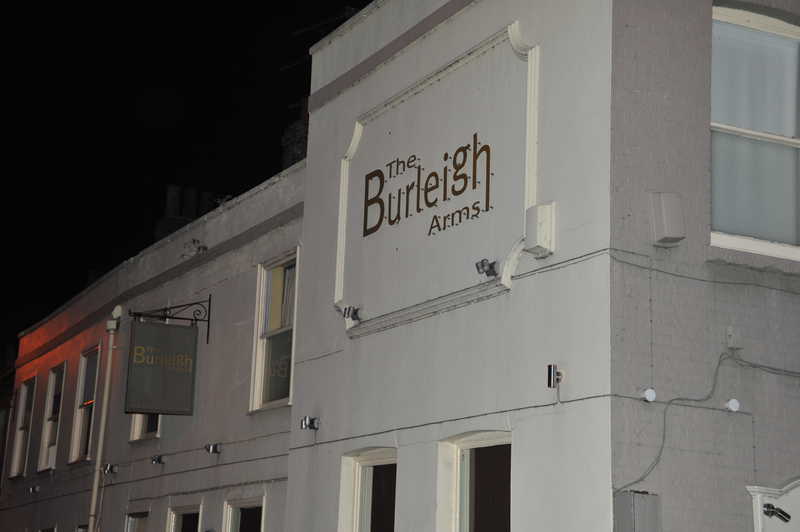 The Burleigh Arms is on the west end (Cambridge side of the East Road roundabout) of Newmarket Road, near Maids Causeway. It's on the north (farther from town) side of the road. Getting there from the town centre probably involves either Emmanuel Road, Clarendon Street, or East Road, and it's about ten minutes from the town centre on foot. It's approximately opposite Christ Church. The area isn't brilliantly lit - don't get mugged. You will, however, be fairly near Midsummer Common, which you may remember from the Arbury Crawl. 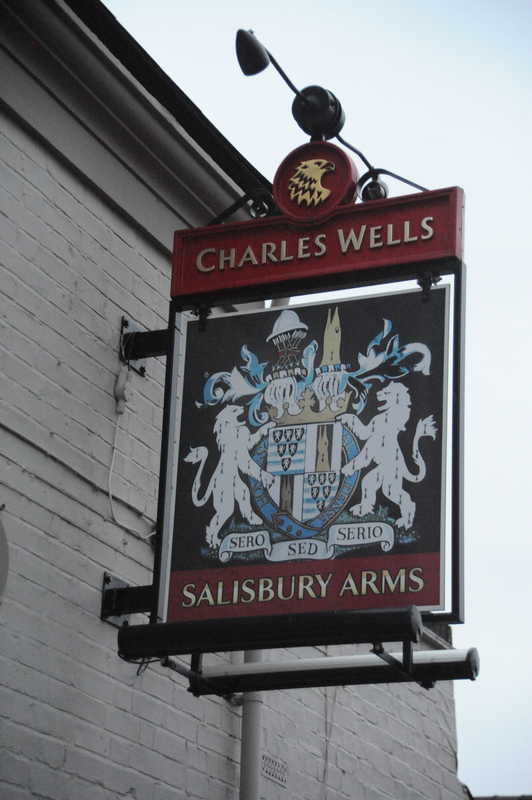 From the Burleigh Arms, turn right to head west along Newmarket Road and onto Maid's Causeway. Cross to the south side of the road, noting the recently deceased Zebra (we tried to keep it going, but it was like flogging a dead horse) and the less-recently-deceased Ancient Druids. 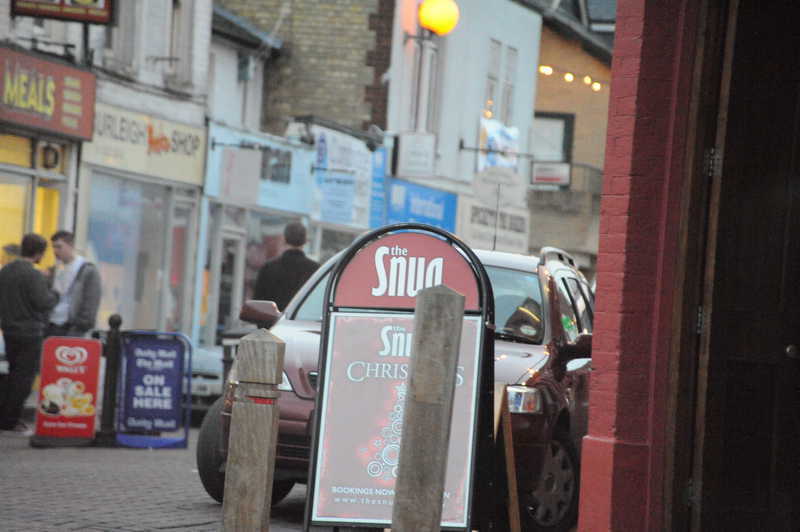 You can go past the car park to a back entrance, but the simple route is to continue to Fair Street and turn left. You'll see the Hopbine on your left as you head south. 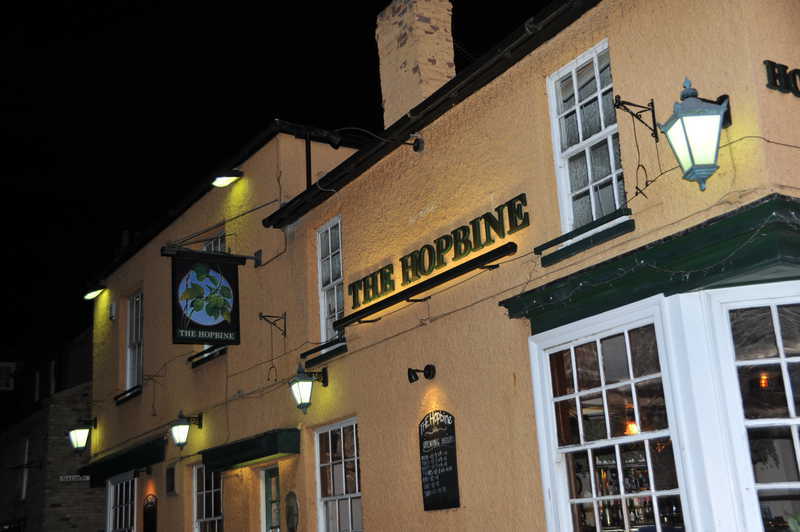 From the main entrance to the Hopbine, head back north to Maid's Causeway and continue to head west. At the roundabout, take the second exit (not Short Street), just after the Wesley Methodist Church, onto King Street. 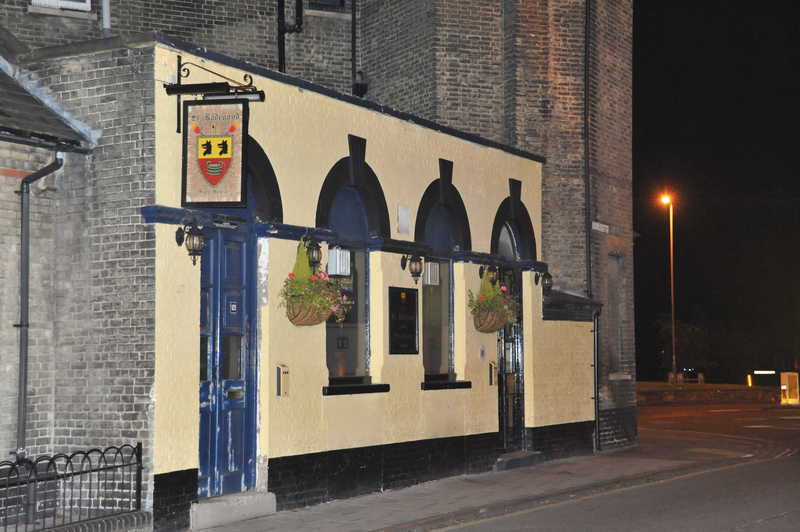 The St Radegund is on the northwest side of King Street, near the roundabout end. It is tiny. The toilets are downstairs, which is sometimes confusing. The adventurous could get here instead via Pike's Walk, involving an exciting walk in the dark through footpaths on Christ's Pieces. The route involves a slightly confusing circumnavigation of a children's playground. Turn right out of the Radegund to continue west along King Street. 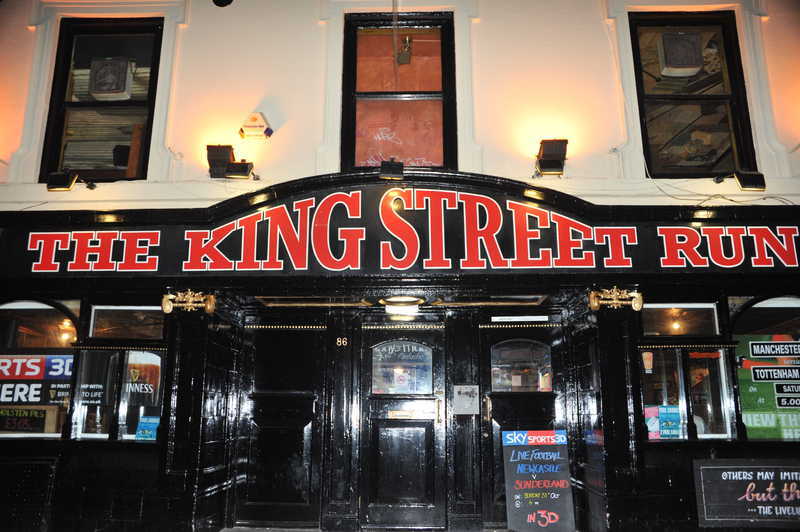 The King Street Run is on the south side of the road (so you'll have to cross over). Don't stop at Efes, that'll take the edge off your curry. From the King Street Run, turn left to continue west along King Street. 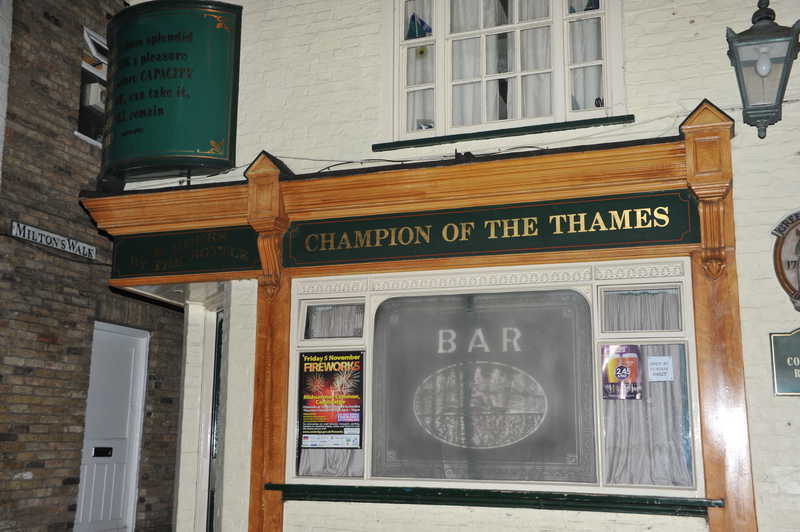 The Champion of the Thames is not very much farther, mercifully, on the same side of the road. Turn left from the Champion of the Thames to continue west along King Street, this time with the tricky manoeuvre of crossing the road. The Cambridge Brew House is just before the turning with Malcolm Street. Google suggests retracing your steps here, but we would normally turn right out of the Cambridge Brew House and head north up Malcolm Street to Jesus Lane, then turn left to head west. At the traffic lights, turn right onto Park Street, past the ADC, and continue northwest. 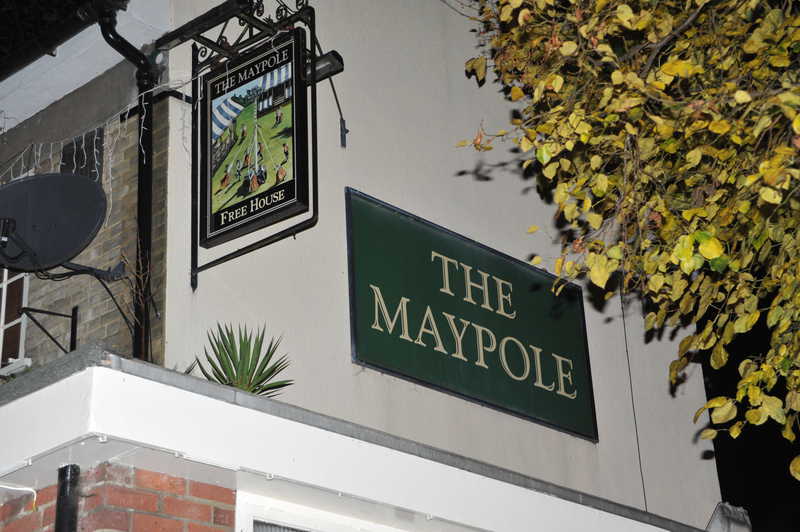 The Maypole is on the west side of the road, next to the car park. 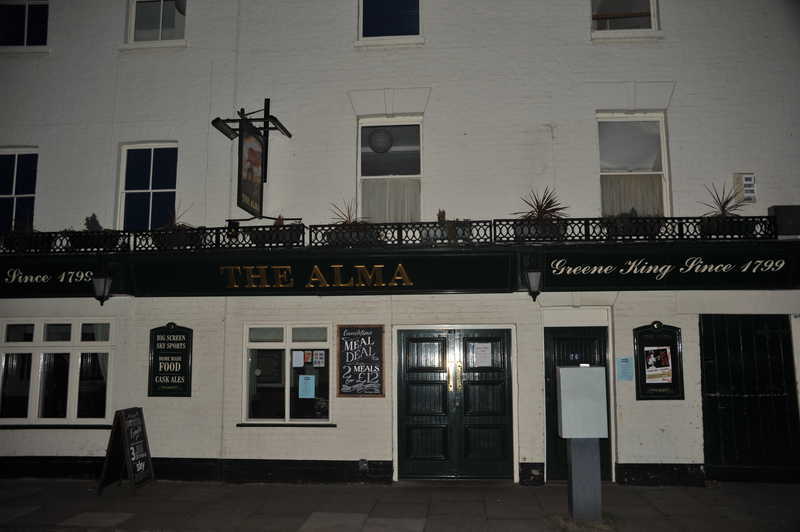 The obvious curry is in the Curry King, which can be accessed either via Portugal Place behind the Maypole, or by going through the car park and past the ticket machines. The Curry King is nearly on Bridge Street, from which heading southeast should return you to civilisation. Meeting in the Brook at 7pm. The Brook is on the south west corner of the junction between Brookfields Avenue (the continuation of Mill Road) and Perne Road. Essentially head down Mill Road out of town until you can't go any further, then head into the nearest pub rather than going to Sainsbury's. Stay on the south side of Mill Road and head west towards town. Do not deviate, for we are Not Here To Enjoy Ourselves. The (Royal) Standard (a resurrected traditional pub) is on the left. From the Standard, walk straight north along Belgrave Road, then take the first left onto St Philip's Road. 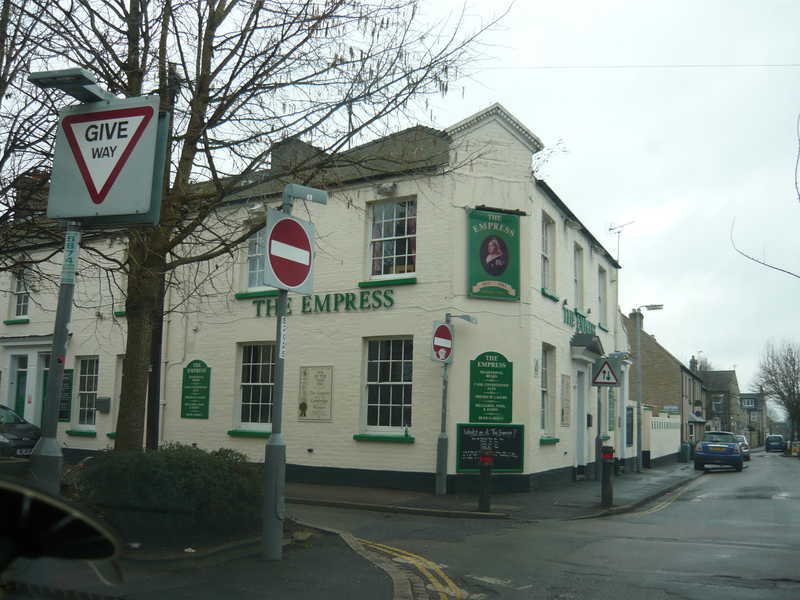 After passing a couple of roads, the Empress is on the right, on the corner of Thoday Street. Head south down Thoday Street until you hit Mill Road, then turn right. 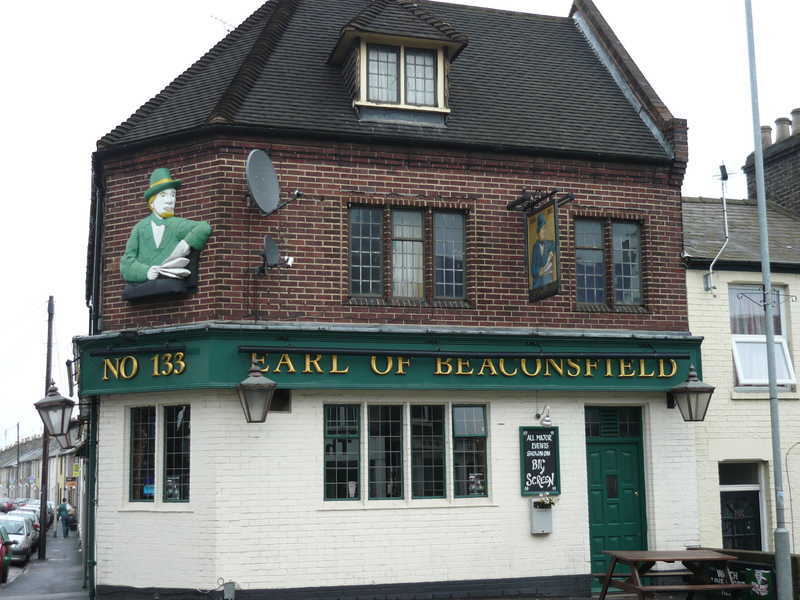 The Earl of Beaconsfield is shortly before the bridge over the railway, so you shouldn't miss it. Turn right out of the Earl, and cross both the bridge and the road, probably not both at once unless you like getting run over. The first left is Devonshire Road, which is A Clue to the fact that the Devonshire Arms is down it (on the right, a little away from Mill Road; if you hit a bend you've gone too far). 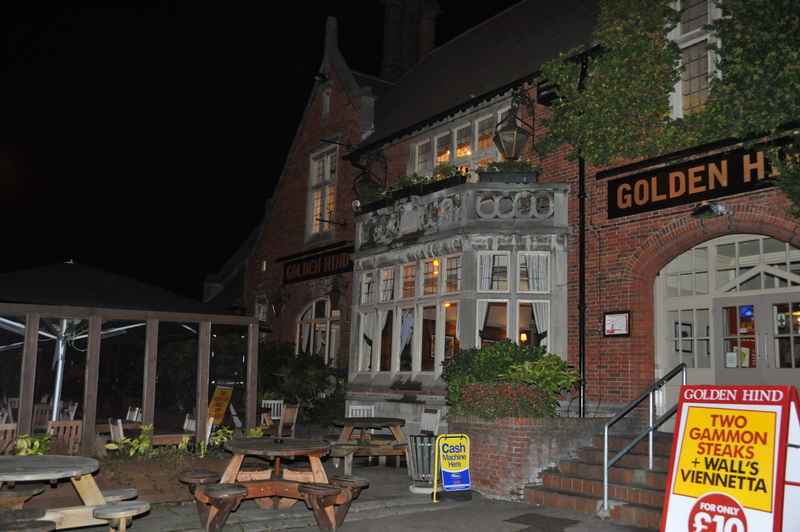 Return north to Mill Road, then turn left and walk past the White Swan and the Curry Queen without getting distracted. 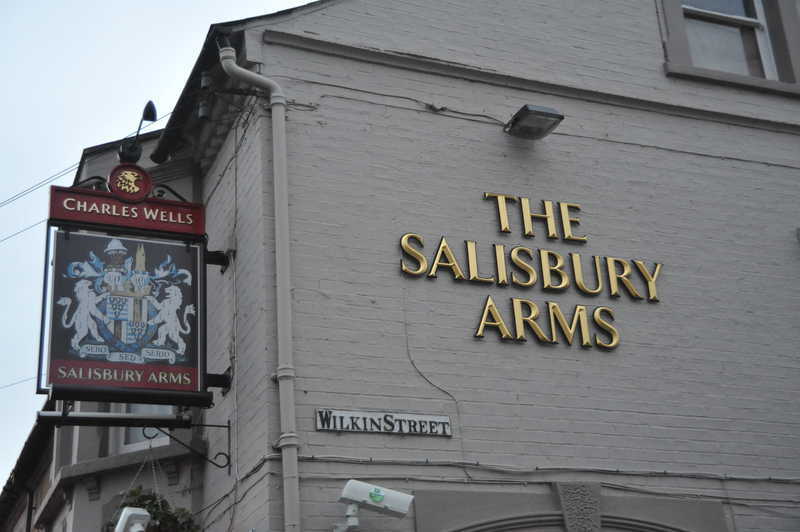 Turn left onto Tenison Road, and the Salisbury can be found on the right on the corner of Wilkin Street. From the Salisbury, head down Wilkin Street, then turn right onto Mawson Road. 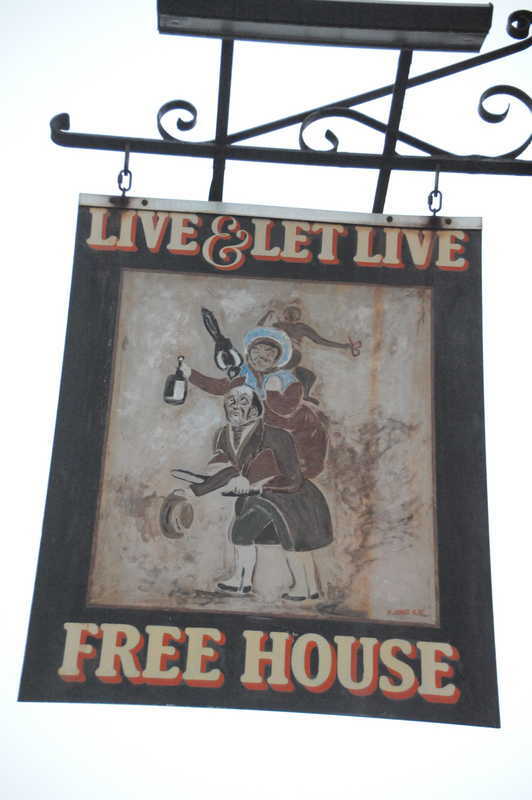 The Live and Let Live is on the left, before Cross Street. 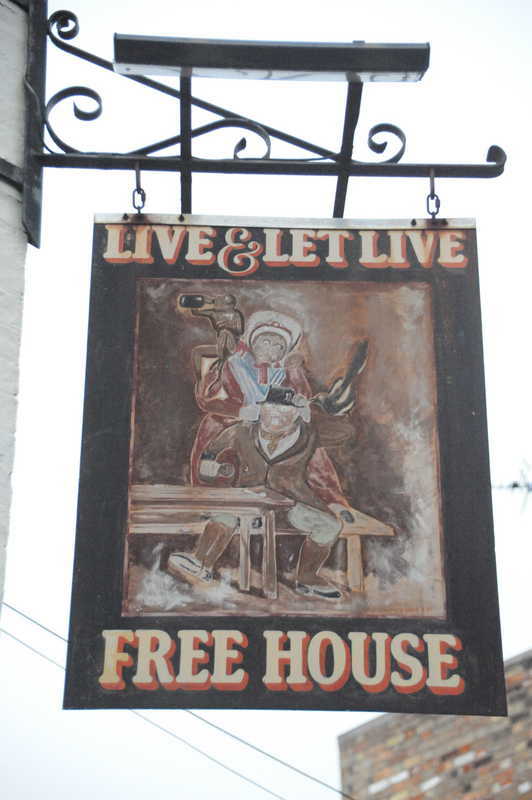 Leave the Live and turn left, then follow Cross Street to Covent Garden (the T-junction); veer right, and the Six Bells is on the right before Mill Street. 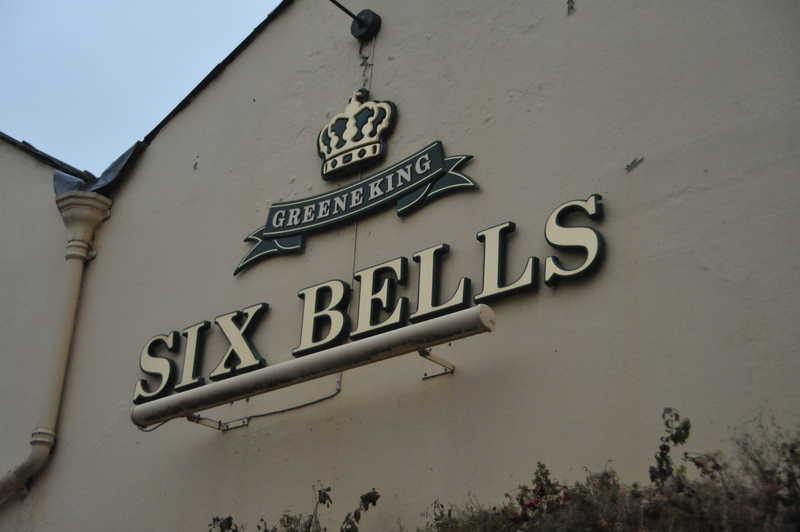 Those desiring curry are encouraged to turn right from the Six Bells along Covent Garden until you reach Mill Road, then turn right. The Curry Queen is on the right shortly before the bridge, where you passed it earlier. Anyone not desiring curry is an abomination, but can be catered for by turning left onto Mill Road and continuing until you get to Parker's Piece, at which (reality check) point you should either know where you are, or be so close to the police station that you can ask someone. Just rememer that you can't trust the specials like the old-time coppers when you can't find your way home. 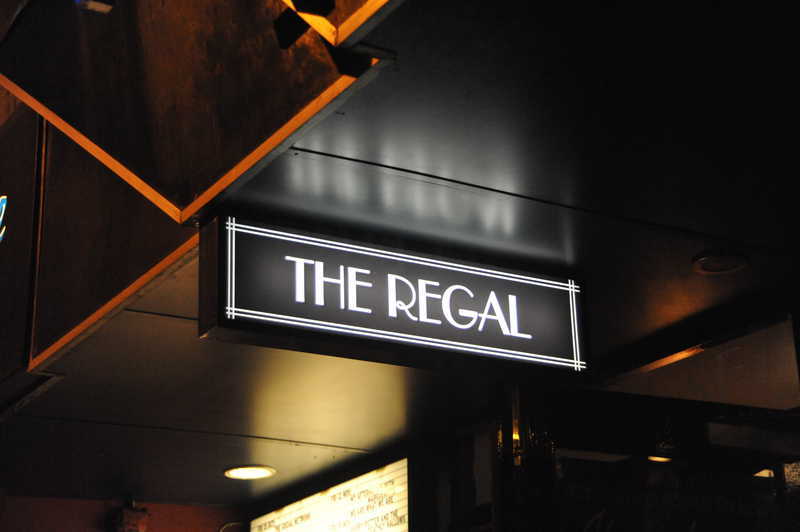 Meeting in the Regal at 10am. 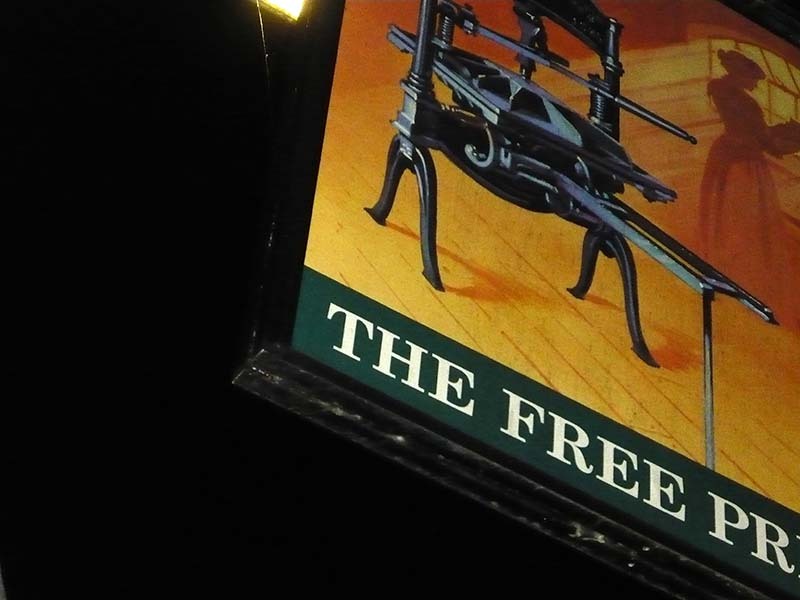 30 pubs visited (although a little after the ETAs), or 31 for Harley. No casualties, but details are complicated. 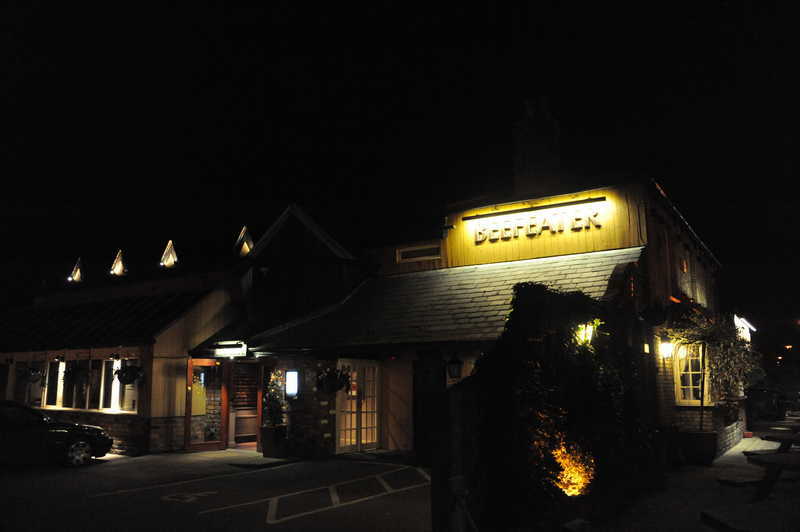 Meeting at the Dobblers at 7:30pm. 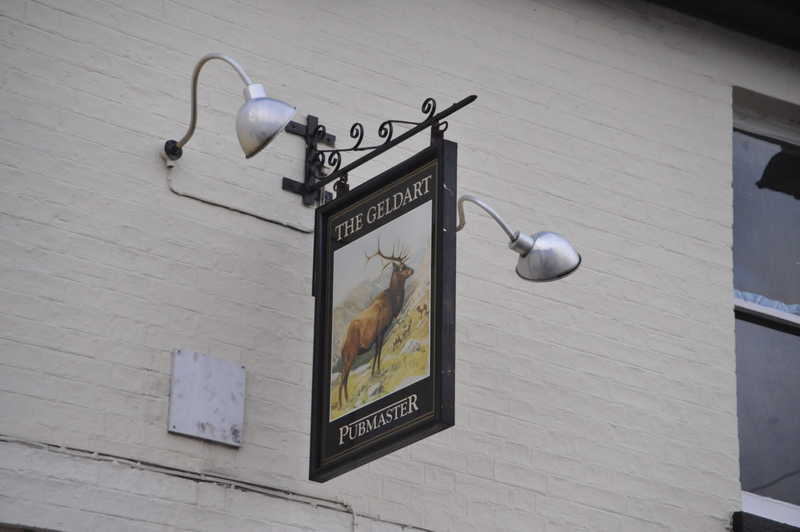 7 pubs plus the Calverley Tap (between the Petersfield and the Kingston Arms) visited. 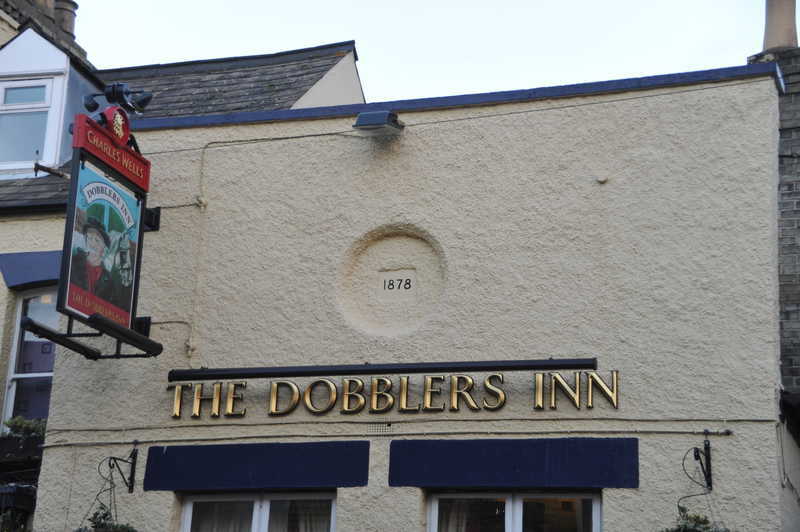 The Dobblers is a little in the middle of nowhere, but you could try walking along Mill Road until you get to Kingston Street and the White Swan, head north past the Kingston Arms, jink to keep heading north past the Petersfield, and keep an eye out on your right. Which is basically this crawl backwards. Head south out of the Dobblers along Sturton Street until you reach Sleaford Street on your left. 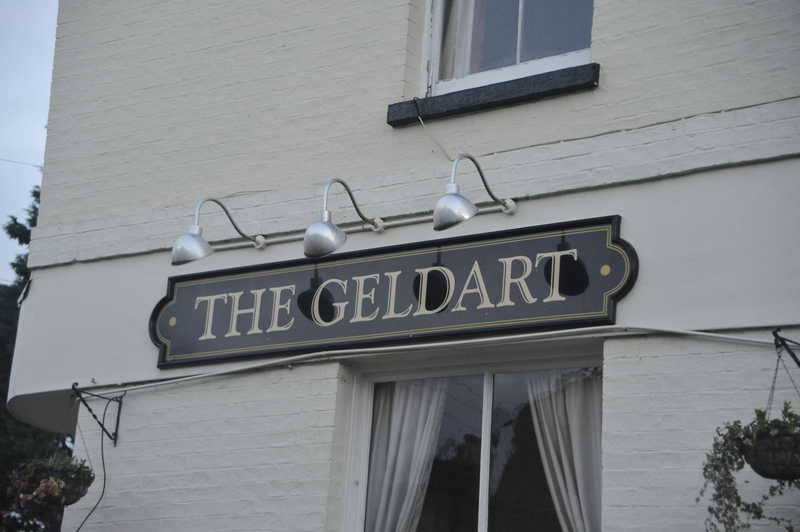 Continue east; the Geldart is on your right, just before Ainsworth Street. Head back west along Sleaford Street, and turn back north along Sturton Street. Take the next left onto Milford Street. 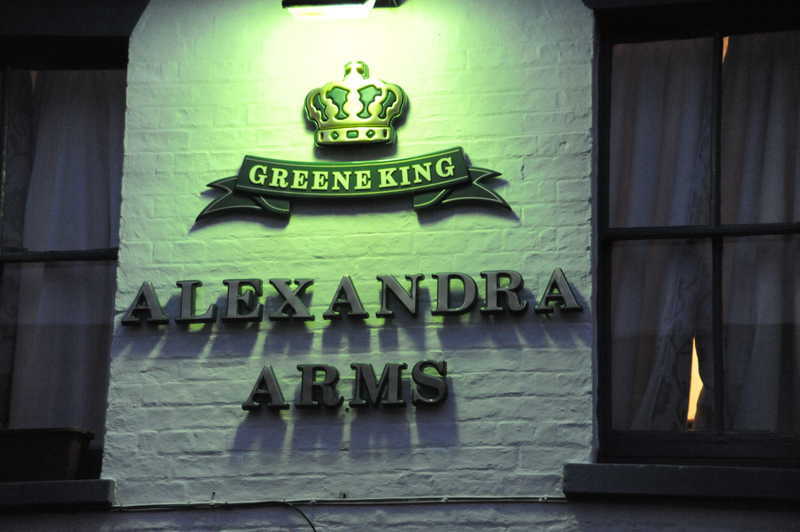 The Alex is on the left, on the corner of Gwydir Street. From the Alex, veer left to head south along Gwydir Street. 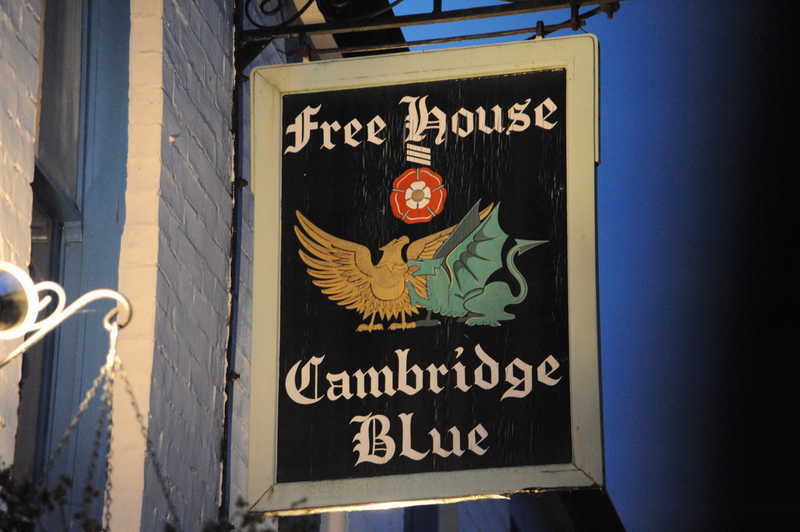 The Cambridge Blue is on the right (west) of the road. Turn right out of the Blue to continue south along Gwydir Street, then take the next left onto Hooper Street. Continue through the pedestrianised section; the Petersfield is on the left, on the far side of the junction with Sturton Street. 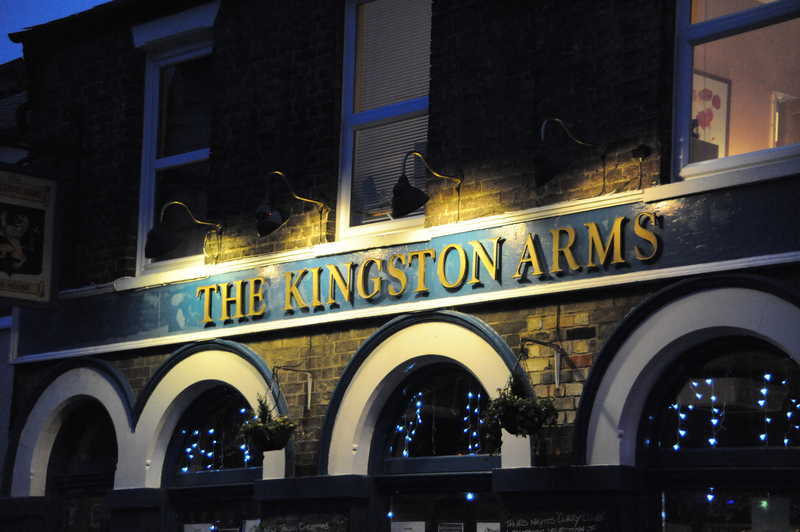 Leave the Petersfield and return through the street furniture to Kingston Street; turn immediately left and head south until you see the Kingston Arms on the left. 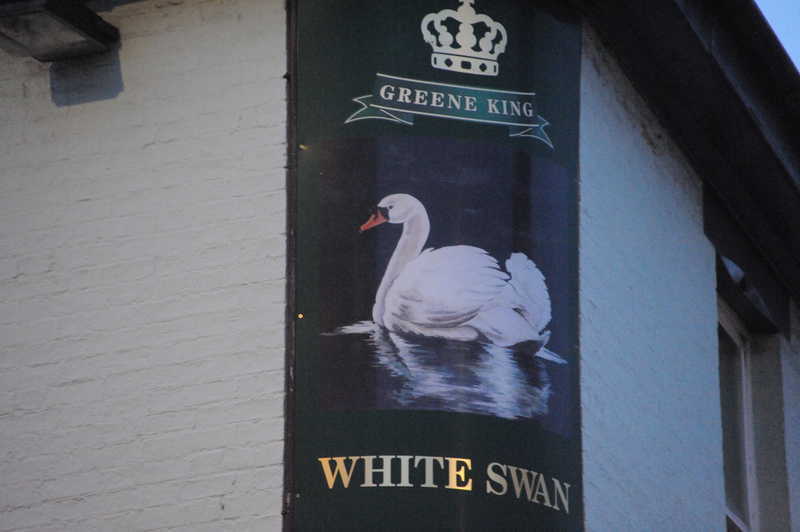 Turn right out of the Kingston, and head south; the White Swan is at the junction of Kingston Street and Mill Road. 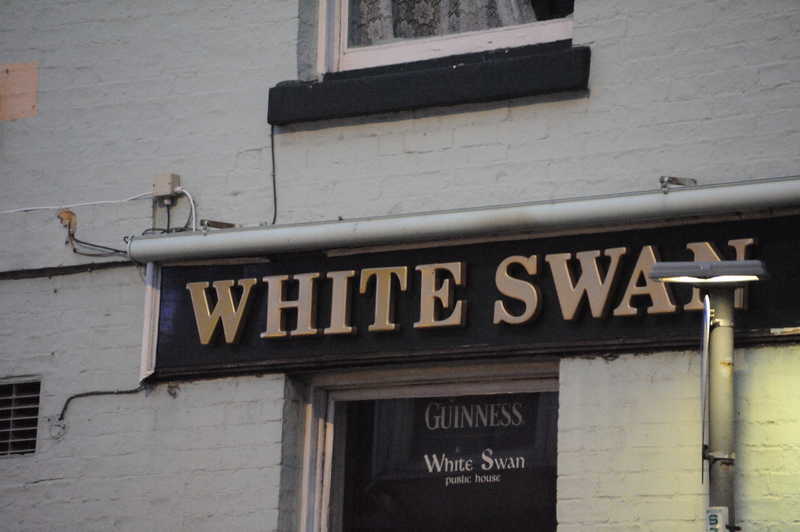 This is complicated: Leave the White Swan, and look ahead. You should see the Curry Queen, which serves curry. For relative civilisation, head west along Mill Road. Meeting at the Fort St George from 6-for-6:30pm. 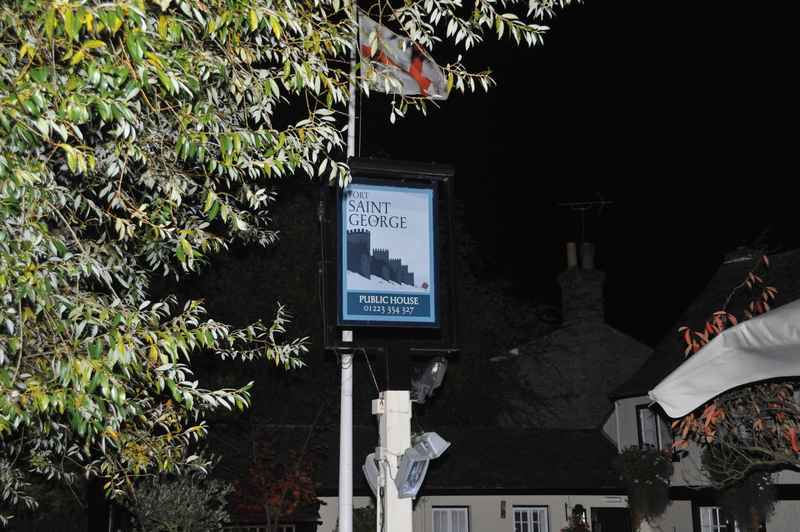 6 pubs plus fireworks attended. Make your way to the Fort St George. This is on the river at the corner of Midsummer Common near Victoria Avenue, by the pedestrian bridge which links to Pretoria Road, and at the junction of several paved paths across Midsummer Common. Since we are doing this crawl on the evening of the fireworks, it will be the pub with the enormous queue of people buying beer and waiting for the fireworks; therefore, don't turn up late. Wait near the pedestrian bridge over the river to watch the fireworks, to beat the rush across the river when they finish. Gawp at the fireworks and try not to get too soggy in the rain. Traditional responses are "ooh", "aah", "bloody hell that was loud" and "why is some oik stinking out everyone within fifty yards with a cigar?" Cross the pedestrian bridge to head north (through the rush of traffic) onto Pretoria Road. Veer left to head west onto Ferry Path (or turn left onto Hamilton Road farther up Pretoria Road, as pedestrian traffic permits). Turn right to head north along Ferry Path. Enter the Old Spring. Gawp at the enormous queue and go thirsty for twenty minutes waiting to get served. 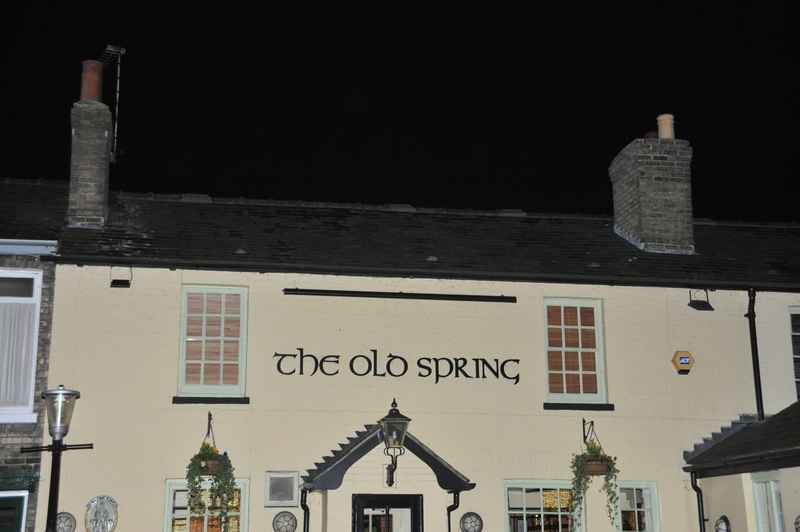 The Old Spring is a perfectly nice pub which turns into a hell-hole of soggy humanity after a rainy fireworks night. Leave the Old Spring and its sense of claustrophobia. Cross Chesterton Road to head north. Head north up your choice of Herbert Street or George Street, both of which may be a little creepy and dark, without getting run over. Turn right to head northeast on Milton Road, and cross to the northwest side of the road. Cross the roundabout to continue on Milton Road. Head past the crossroads with Arbury Road, briefly bowing your head at the passing of the Grove/Snowcat which used to be to the north. 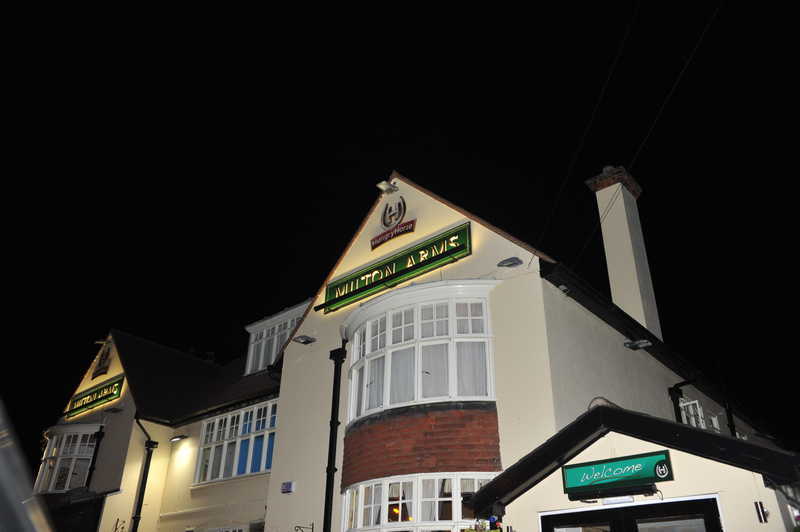 Keep heading quite a long way up Milton Road until you reach the Milton Arms, with the Hungry Horse sign outside. This was a fairly long trundle, so you might want a sit down. 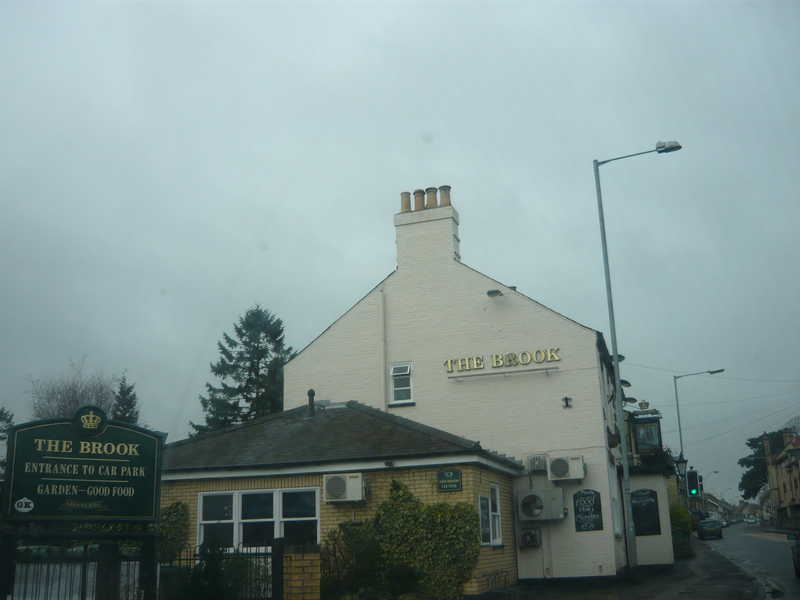 Leave the Milton Arms, even if it's raining, and keep heading northeast to the traffic-light junction with King's Hedges Road. Cross over, and enter the Golden Hind. Buy beer. You should know how to do this by now. 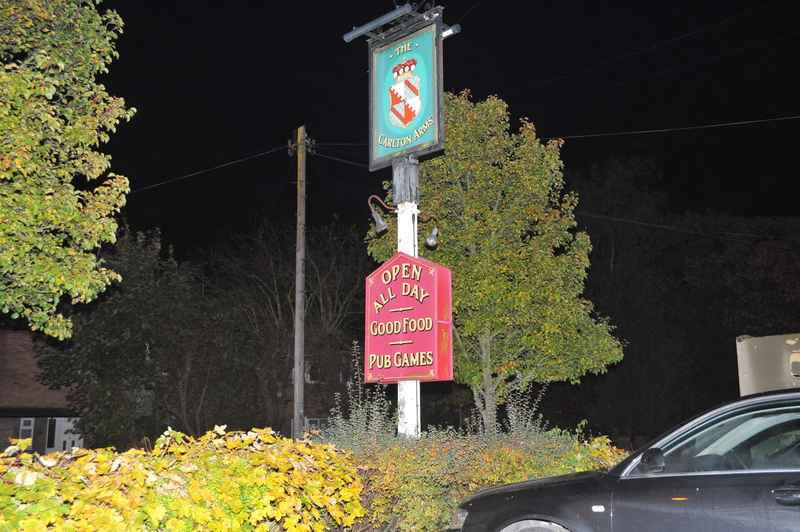 Head northwest out of the Golden Hind along King's Hedges Road, crossing the road. When you get to Campkin Road, head southwest along it. Follow the road round the bend as it veers northwest. Go straight across the mini-roundabout with Hawkins Road, and continue to the next mini-roundabout with St Kilda Avenue. The Jenny Wren is on the right, but is apparently sadly defunct. Continue along Campkin Road, then take the path at the back of the off-road parking area on the north of the road - the path runs along the back of some buildings, with trees to your right. Keep heading northwest with houses to your left and greenery to your right. Once you run out of houses to the left (you should still have a park to your right), veer left past some trees, and the pathway will eventually join Cameron Road, heading southwest. You will shortly see the Ship on the right, although you might have to circumnavigate it to find an entrance that works. Note that Google Maps is a little confused about where the Ship is: try to buy beer at the pub, not the bus stop. Leave the Ship, ideally onto Northfield Avenue, and head southwest by turning left. Take the right turn at the mini-roundabout with Roxburgh Road (which turns into Sackville Close), then head southwest at the first left to stay on Roxburgh Road. As a pedestrian, you should be able to get through to Arbury Road at the end, cross over, and turn right - then promptly turn left again into Mere Way to continue southwest. 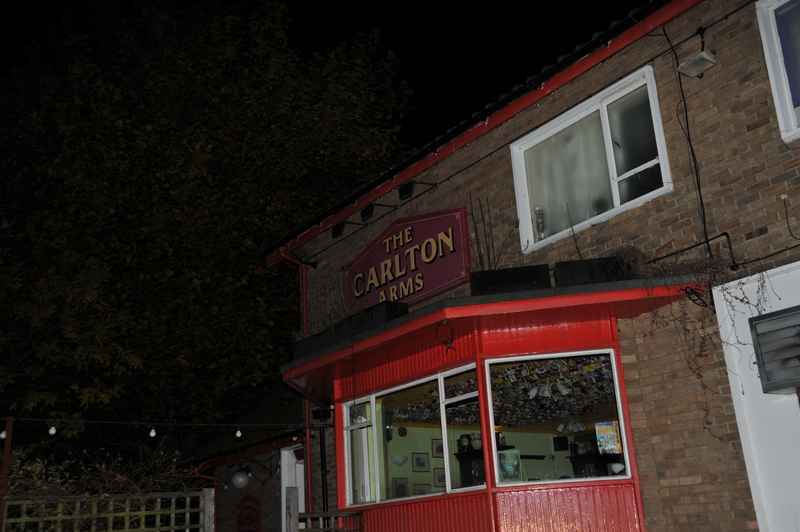 After a while, Mere way turns into Carlton Way, and from Carlton Way, you should turn into the Carlton Arms (which is on the west side after quite a long walk, after Metcalfe Road, but before Gilbert Road. The nearest curry option is not obvious, so we often don't bother. Routes back to town include returning to Milton Road by turning left onto Gilbert Road (and right at the end), turning right onto Gilbert Road and left onto Histon Road, and using Stretten Avenue to cut the corner through to Victoria Road. Other popular options include metal boxes driven by hydrocarbons. Meeting in the Regal at 7:30pm. 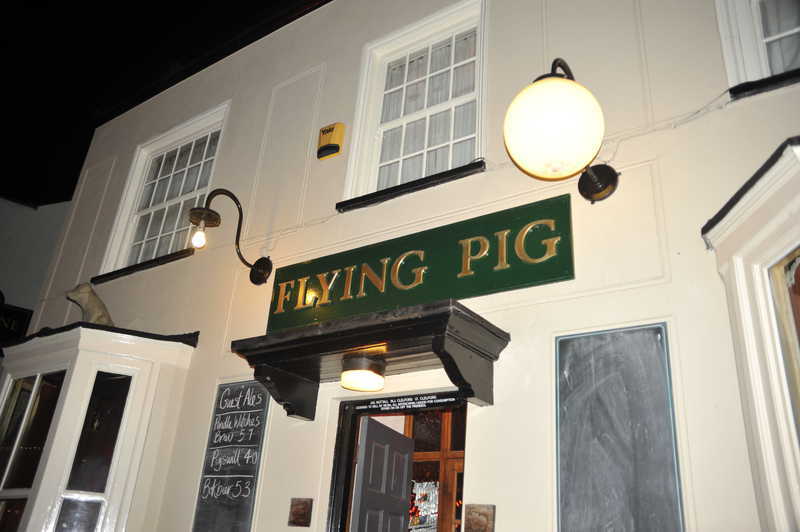 8 pubs visited, plus a bonus The Flying Pig for some. The Regal (...Wetherspoon) is on St Andrew's Street, southeast of and opposite the entrance to Emmanuel and next to the Castle Bar (not to be confused with the Castle Inn). It used to be a cinema, and is big. The bar itself is not so big, so actually getting a drink can take a while on busy evenings. Leave The Regal and turn right, wandering southeast along St Andrew's, which turns into Regent Street and passes the entrance to Downing. Opposite a restaurant that Google currently reports as "Seven Days" (may The Gandhi rest in peace) and before Noodle Republic (don't take the edge off your curry) there's a little alleyway on the left, heading northeast. 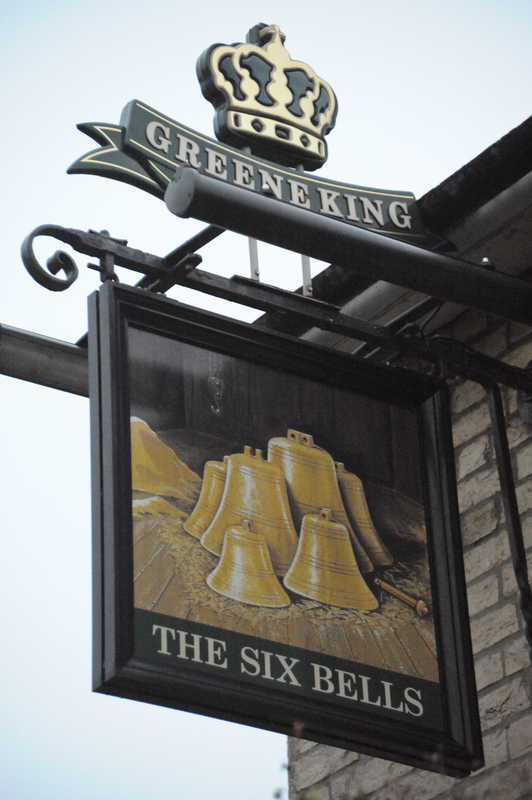 At the end of it should be the welcoming sign of the Grain & Hop Store, which has historically also been the Avery and the Hogshead. It sells beer. You know what to do. Leave the Grain & Hop Store (by the same entrance, otherwise you'll be facing Parker's Piece) and return to Regent Street. 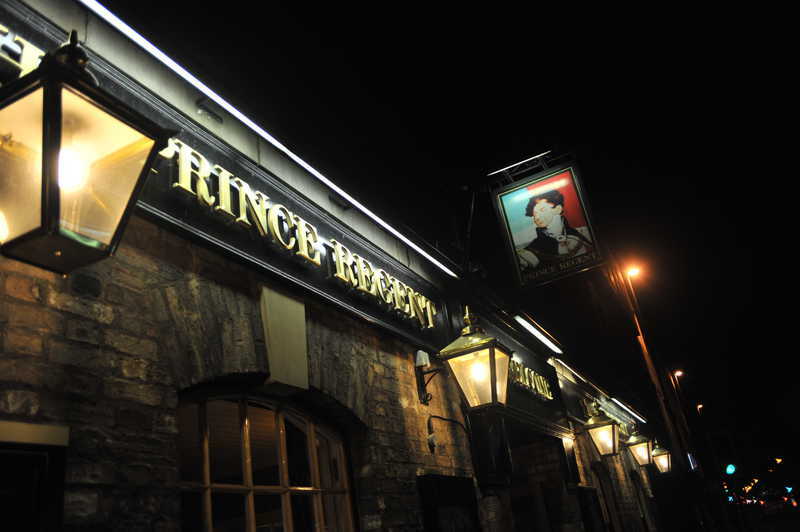 Turn left, and after a brief walk you'll find the Prince Regent on the left. This should not be complicated, so long as you don't confuse it with the Regent Cafe. If you're feeling adventurous, you could instead leave by the Parker's Piece exit from the Grain & Hop Store and turn right to walk along Regent Terrace; the Prince Regent has a back passage on your right. Delight in the fact that Google Maps can't show you this, because it doesn't understand a route that goes through a pub and leaves by a different exit. Leave the Prince Regent from the Regent Street exit, turn left and cross Regent Street, continuing to head southeast. The Old Bicycle Shop will be on your right, and has amusing bicycle parts stuck on the walls. Don't be confused by the name - it's only old as a bicycle shop, it's actually quite new as a pub (hence I've not uploaded the pub sign yet). Brace yourself, this is more complicated. Turn right out of the Old Bicycle Shop, and continue right at the crossroads to head southeast onto Lensfield Road, crossing at your convenience and trying not to get run over (there is a pedestrian crossing for the patient). On the left after the car park of the Chemistry Department (which the young and exuberant may choose to use as a way to cut a corner), turn left onto Panton Street, heading south. 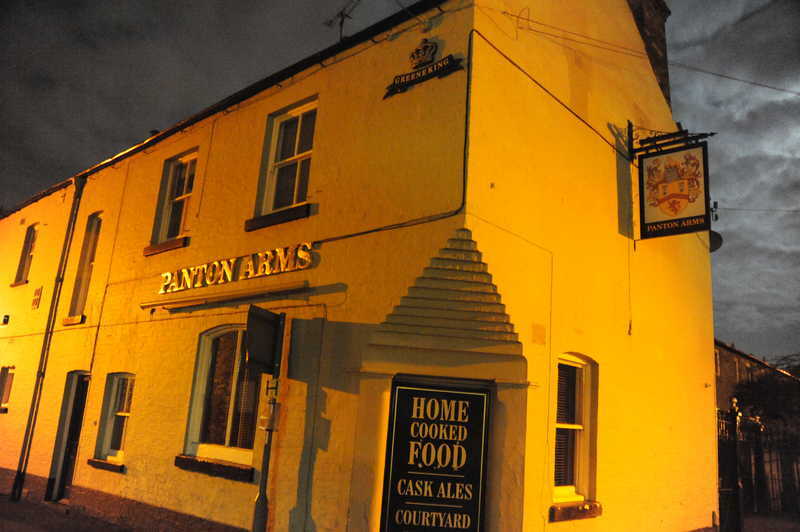 The Panton Arms is on the left, after Coronation Street. This you may recognise as a favoured lunchtime venue for winks tournaments held in Downing. 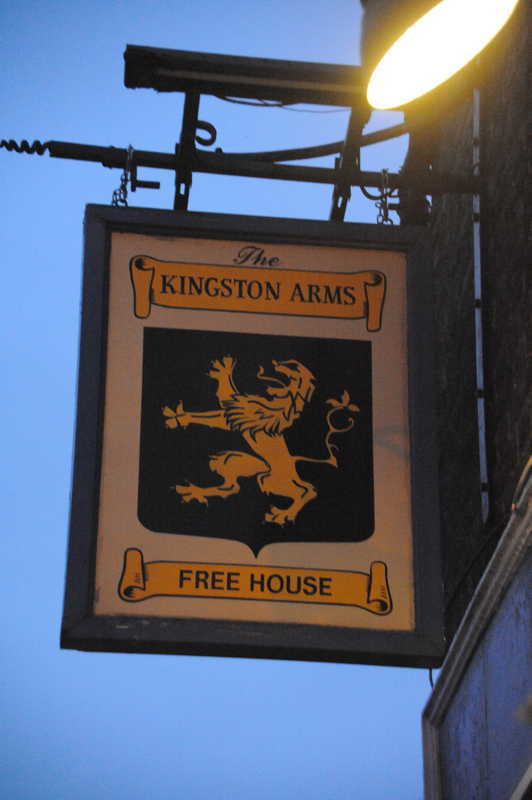 From the Panton Arms, turn left to continue south along Panton Street, then take the first left onto Russell Court. 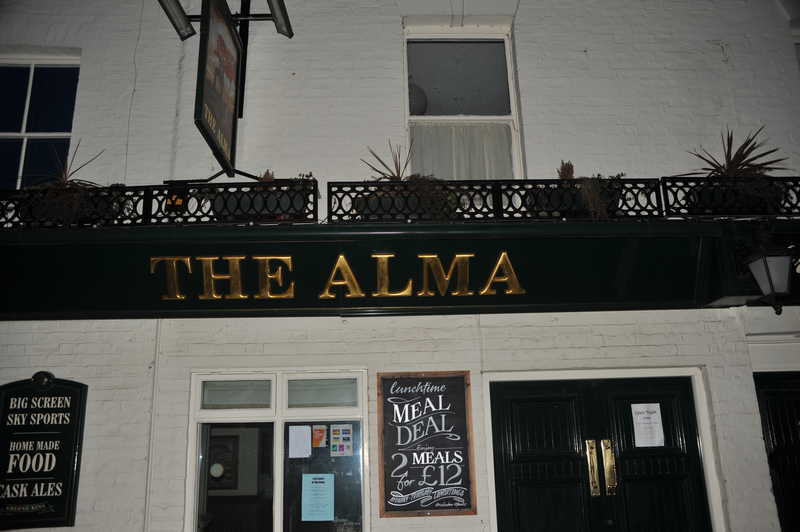 The Alma is on the right. It's near enough to the Panton that you could see it if there weren't a building in the way (although Cambridge being flat, this doesn't say much), or you could hit it by throwing a stone - but don't do that, because it'll be cold if you break a window. They like their flags inside, and you can have fun identifying them, honest. Sadly they no longer keep Piranha in a telephone booth. Turn right out of the Alma and follow Russell Court as it wiggles, veering right when you can. When you hit a crossroads with Norwich Street (which is not obviously near the A11), turn left to head east, which will eventually bring you to Hills Road (which is relatively large and likely full of traffic). Turn right to head southeast and cross over, passing the botanic gardens, and turn left onto Station Road. You may be able to tell where this is going. That's correct, it's going east. At the end of it is the Station (surprise! 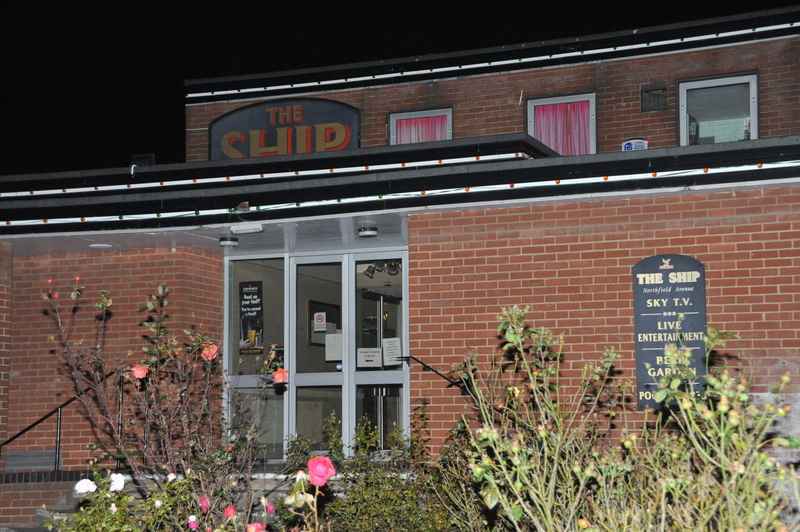 ), which has been newly revamped and therefore is only loosely known to me. I'm assured (by Google Maps, which is never wrong) that the Station Tavern can be found to the left, under the Ibis hotel. The Station Tavern is allegedly right next to the Old Ticket Office (which is to its southeast). Not having been there since the revamp, I don't actually know where the entrances to these establishments are, so that'll be an exciting adventure for everyone. At this point, you will naturally be wondering about a curry. A reasonable way to achieve such a thing is to head back west along Station Road, not getting confused and ending on the guided busway, and returning to Hills Road. Veer right to head northwest into town, and more importantly to the Saffron Brasserie, which is on the left (aka the far side of the road) between Russell Street and Coronation Street, and vaguely opposite St Paul's Church, although it does have a bit of a tendency to close before crawlers are likely to reach it. Relative civilisation can be reached by continuing northwest on Hills Road and continuing at the crossroads onto Regent Street. If you don't know where you are after heading down Regent Street onto St Andrew's Street, I can't help you, because this is where you started. 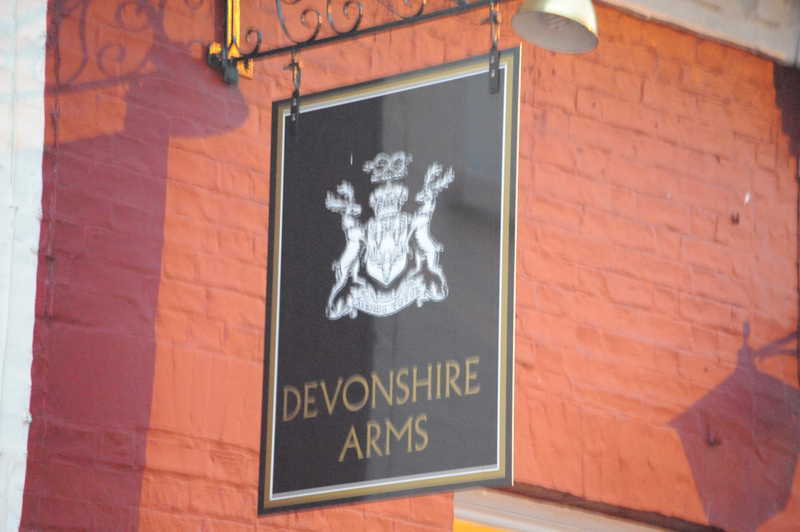 Meeting in the Clarendon Arms at 7:30pm. 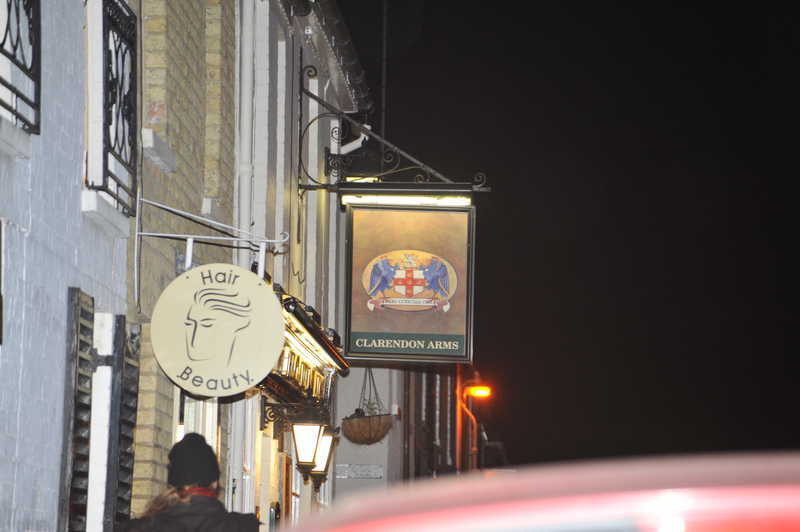 The Clarendon Arms is, helpfully, on Clarendon Street. 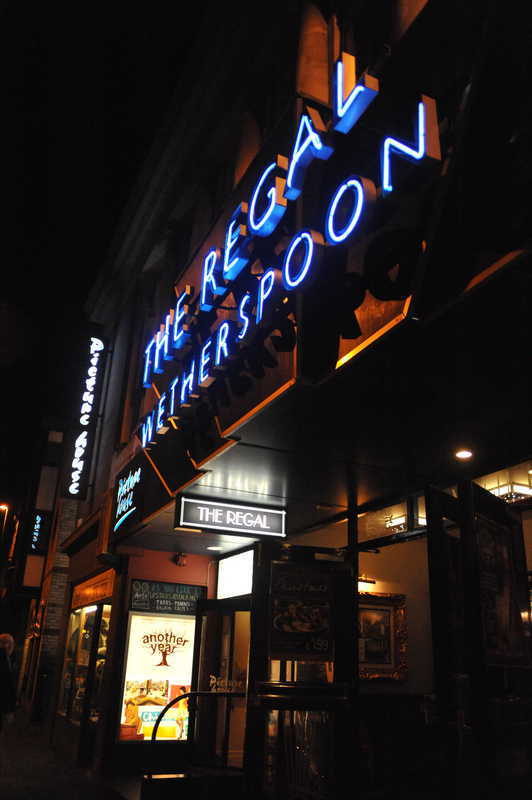 One way to find this is to head down Regent Street until you find the University Arms hotel. This used to be a big building that looked a bit like the Kremlin, but now appears to have gone a bit classical, although at the time of writing Google Street View mostly makes it look like a building site. If you find a Pizza Hut next to a cycle path crossing Parker's Piece, you're slightly too far south, because you really want to look for Park Terrace, the one way street that's alongside the University Arms. Go down it the right way, and keep going where it crosses Parker Street and Parkside (otherwise you'll end up in a bus station or a police station) and you'll find Clarendon Street. 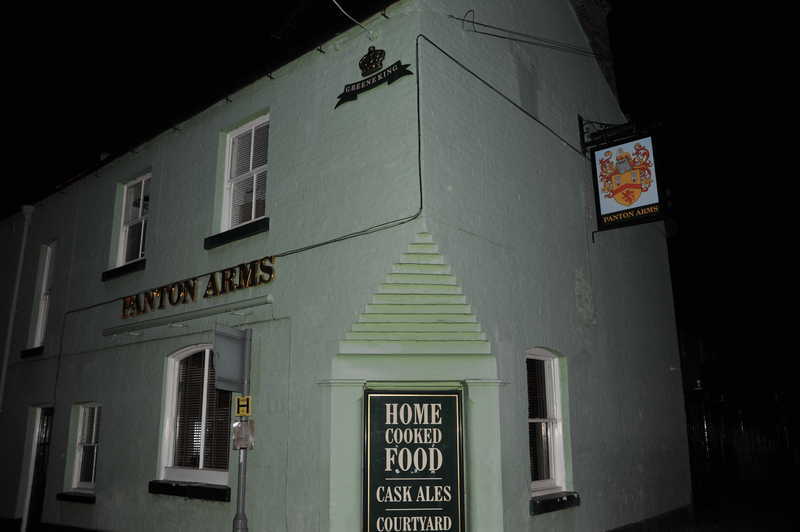 The Clarendon Arms is on the left, a little way up. Turn left out of the Clarendon to head north. After a while, on the right there's a pedestrian alley that's possibly a continuation of Orchard Street. Google Maps has historically been very confused about the Elm Tree, and although it now has the location correct, it still won't let me check the name of this street. I suspect someone working for Google lives there and is playing silly buggers. 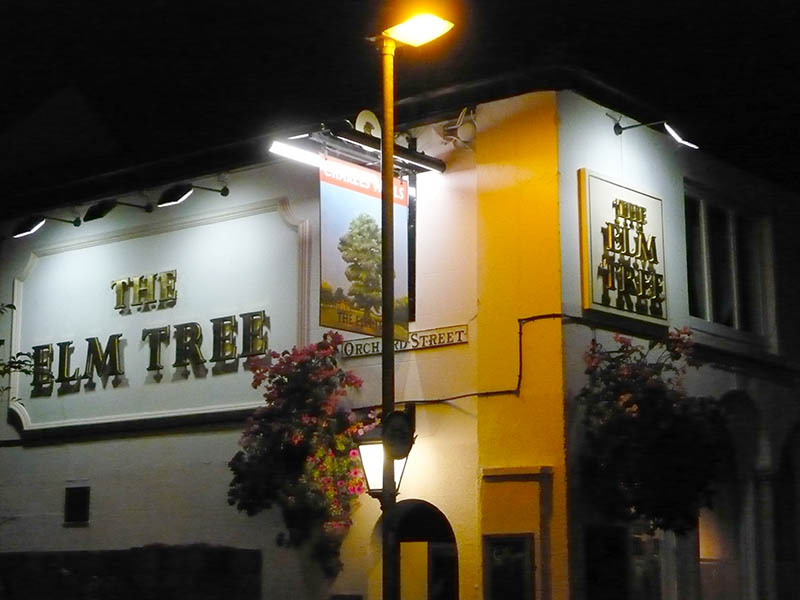 Anyway, turn down the pedestrian thingy, and the Elm Tree is on the left at the end. If that doesn't work for you, take the next right on Elm Street and walk around the Elm Tree at the end. 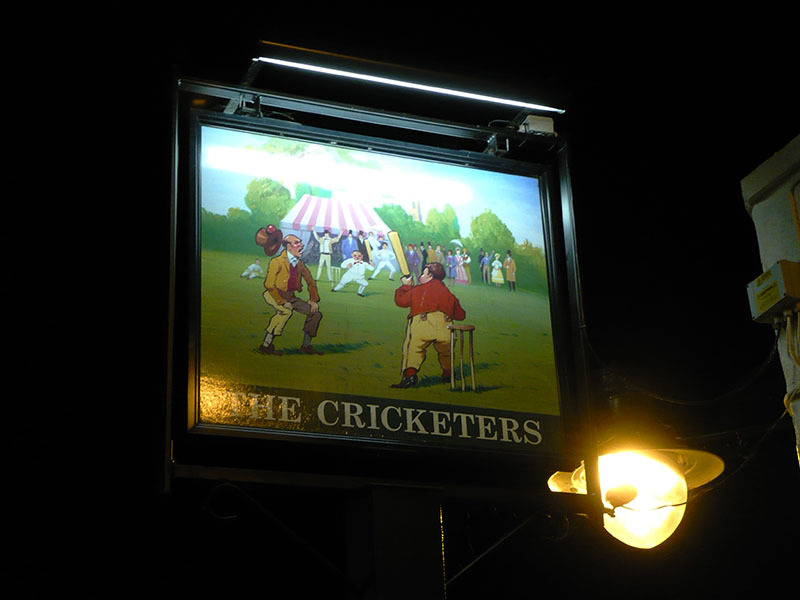 Leaving the Elm Tree, you may notice that the Cricketers is basically opposite you, to the south, so you should be able to work out what to do; the entrance is on the pedestrianised Melbourne Place. 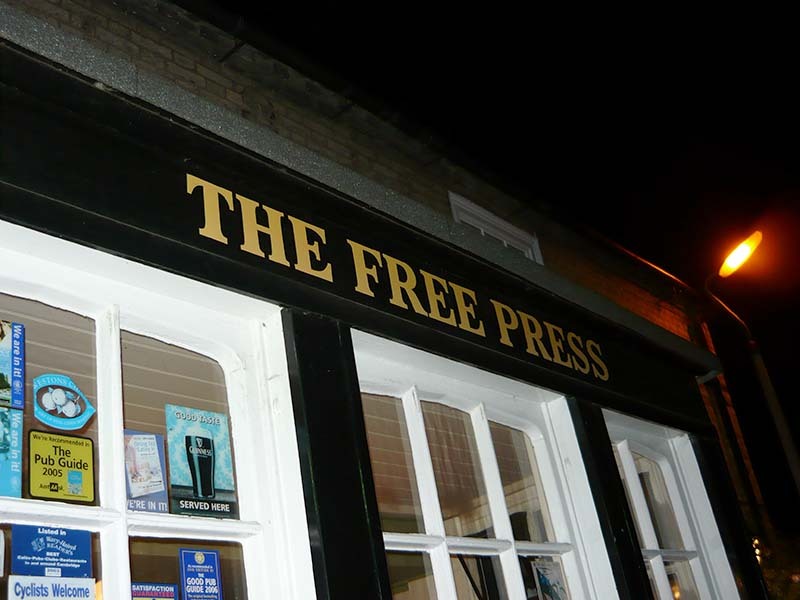 The biggest risk is a typo on the term card, which may mislead you into trying to visit the Free Press first, which involves unnecessary backtracking. From the Cricketers, turn right and get back to Prospect Row, and head southeast. The Free Press is on the left after a bit. Unless they've modernised, they're a bit stroppy about people using phones, so memorise the next bit. Turn left out of the Free Press. Continue to the end of Prospect Row and veer left onto Adam and Eve street, then right onto Dover Street. The Tram Depot is on the left, and looks a bit like a tram depot. 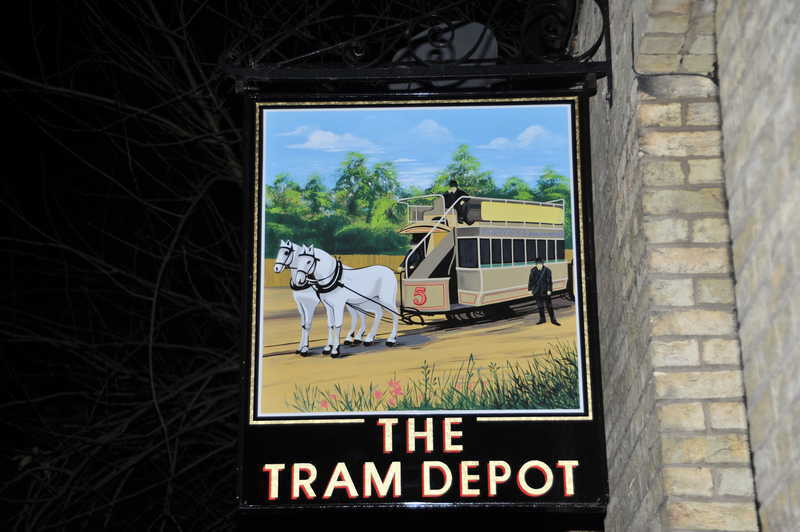 From the Tram Depot, turn left and walk to East Road (the big busy one). Then turn left to head northeast-ish. The Duke of Cambridge is on the left, just before a KFC (which would take the edge off your curry). 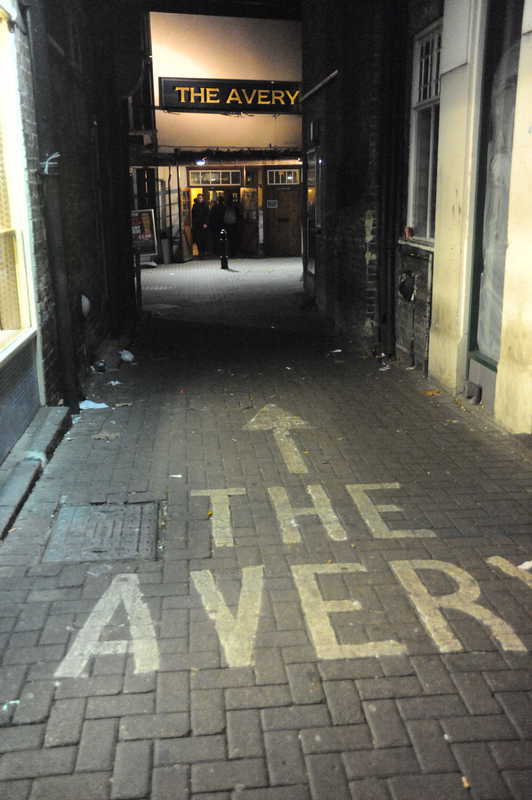 You can also get into the Duke of Cambridge's back passage via Adam and Eve Street, if you prefer. From the East Road exit of the Duke of Cambridge, turn left past the KFC and head northeast. 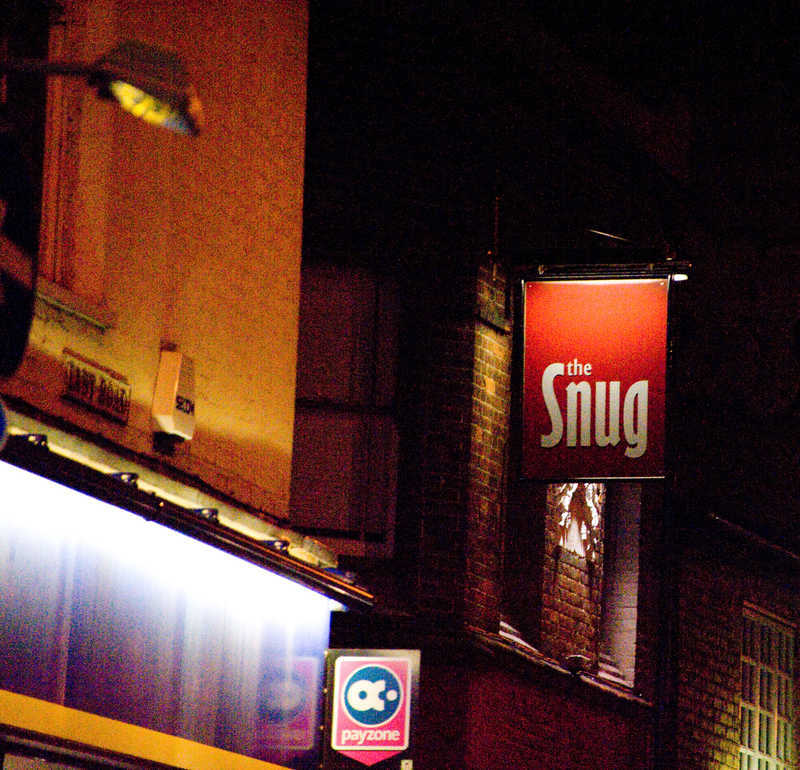 The "Snug Bar Grafton" (aka The-Snug-that-used-to-be-The-Vine-not-the-other-one-on-Lensfield-Road) is on the left, down Burleigh Street, which those familiar with Cambridge establishments will note is confusingly not the location of the Burleigh Arms. From the Vine, cross East Road (you'll be at the point where it changes between a dual carriageway and a single carriageway). You should be approximately in line with Norfolk Street, which is convenient because you should now head east along it. the Blue Moon is on the left, just after Staffordshire Street. From the Blue Moon, you could return to East Road, head south, then at the corner of Parker's Piece walk diagonally across the Reality Checkpoint to get to Regent Street. But actually you want a curry, so you shouldn't do this. Instead, continue east along Norfolk Street to the T-junction with Gwydir Street, and turn right to head south. 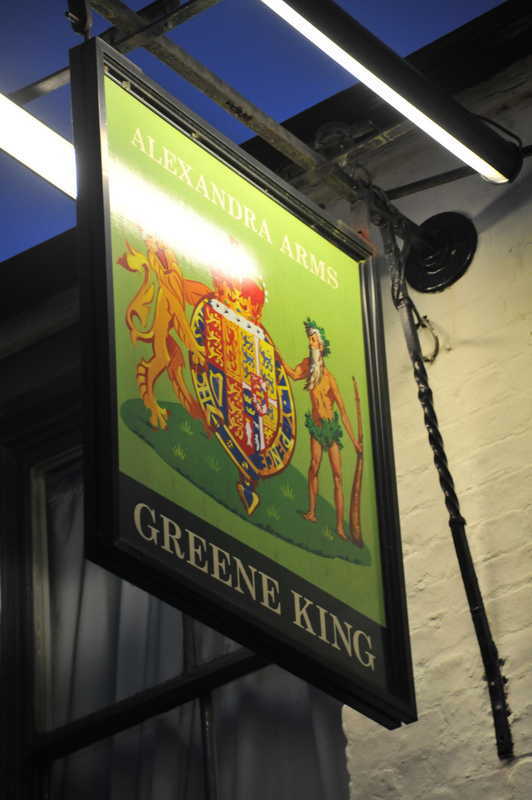 You will walk quite a long way, in the process passing the Alex and the Cambridge Blue; don't worry, we'll come back to them. Eventually you'll reach Mill Road, where we run out of Gwydir Street (or you can cut through the Gwydir Street car park if you prefer). Turn left and cross the road, and you should find the Curry Queen almost opposite the White Swan. At the time of writing, Google Maps seems to be conflating the Lloyd's Bank on the corner of St Barnabas Road with the Curry Queen, which it wasn't, last I looked. Once full of curry, turn left to head west along Mill Road until you get to Parker's Piece (big grassy thing), then cut across the diagonal to reach Regent Street. Hopefully you can cope from there, because we don't like to lose students this early in the academic year.